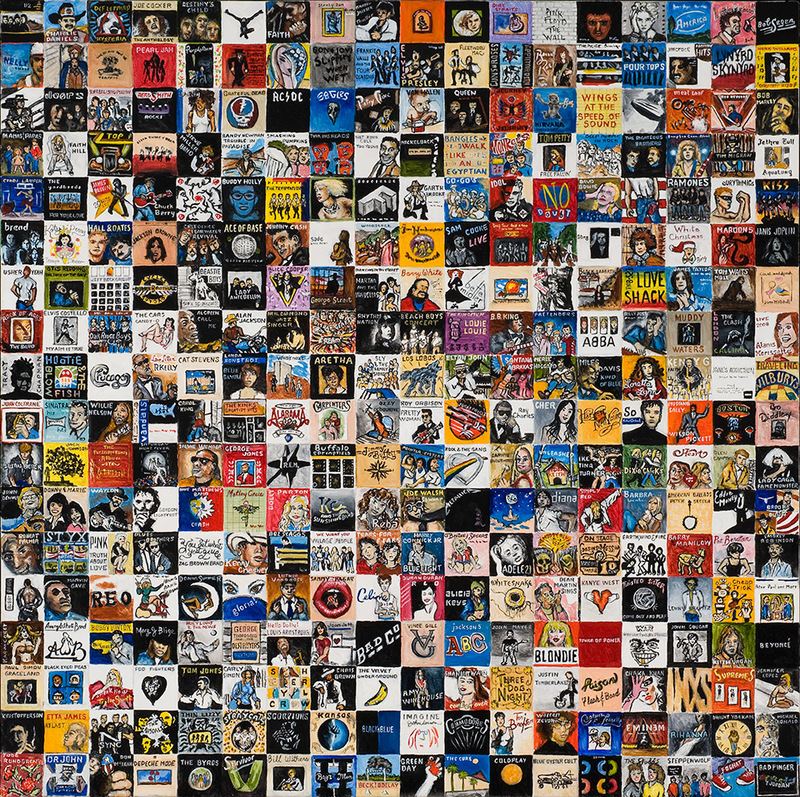 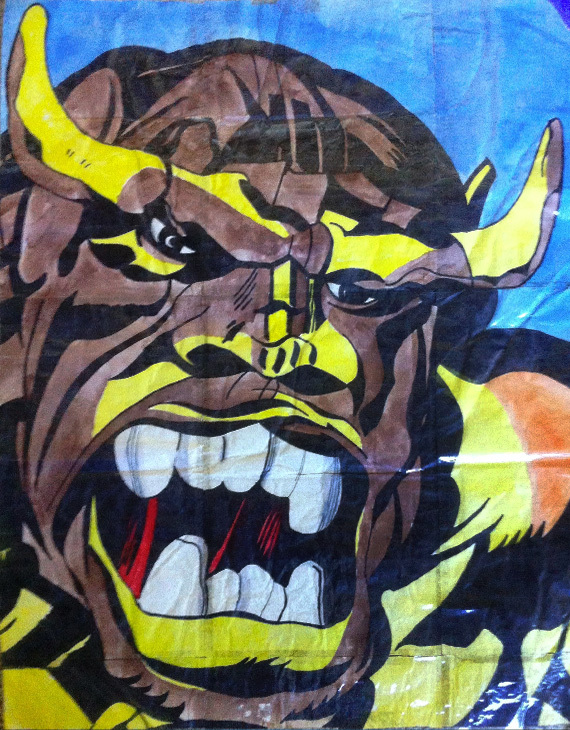 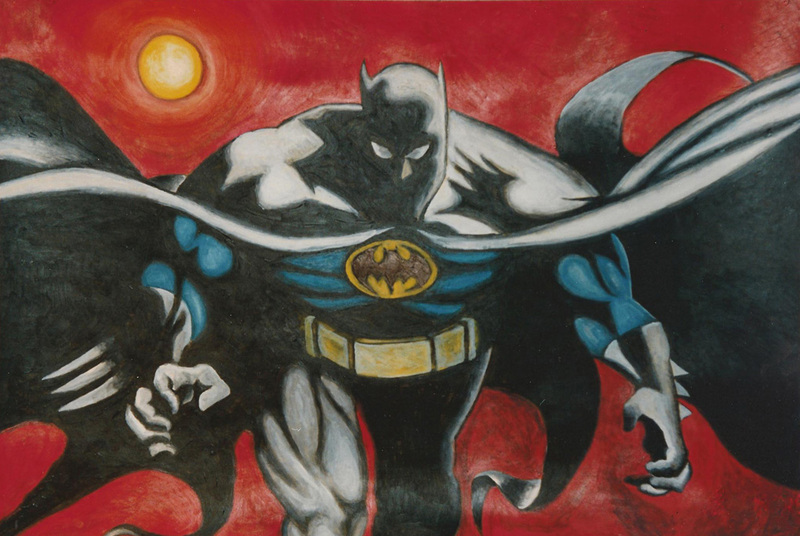 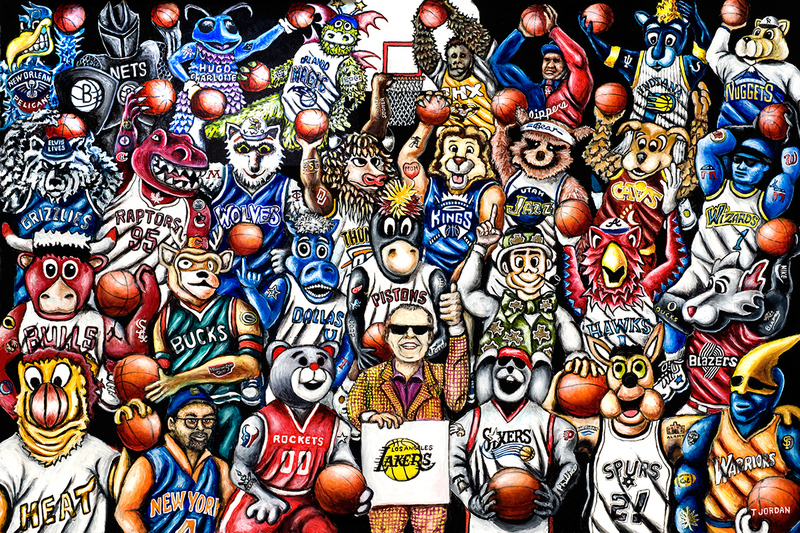 True Believers, Who's #1, Classic Vinyl and other Sports & Entertainment Art Prints are available for purchase. 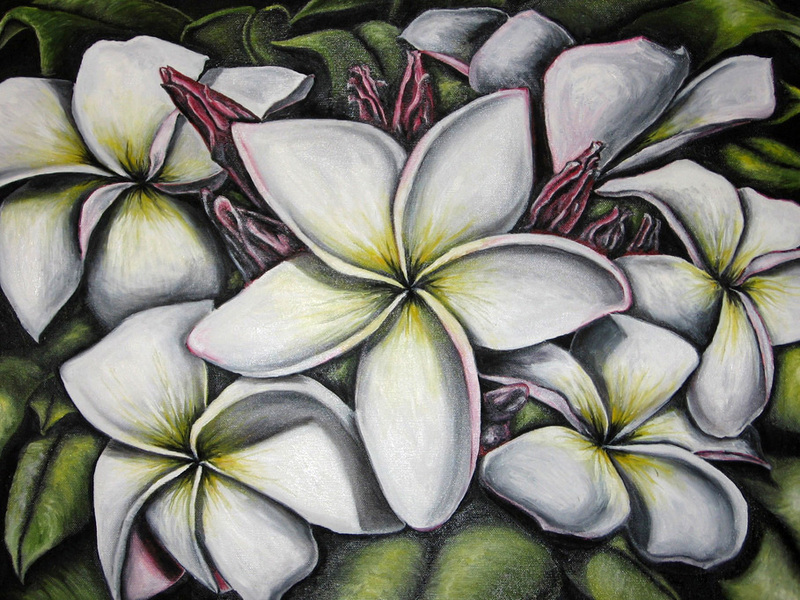 Thomas Jordan Gallery canvas giclees, framed prints or paper prints are available for purchase at the Thomas Jordan Gallery On-Line Store. 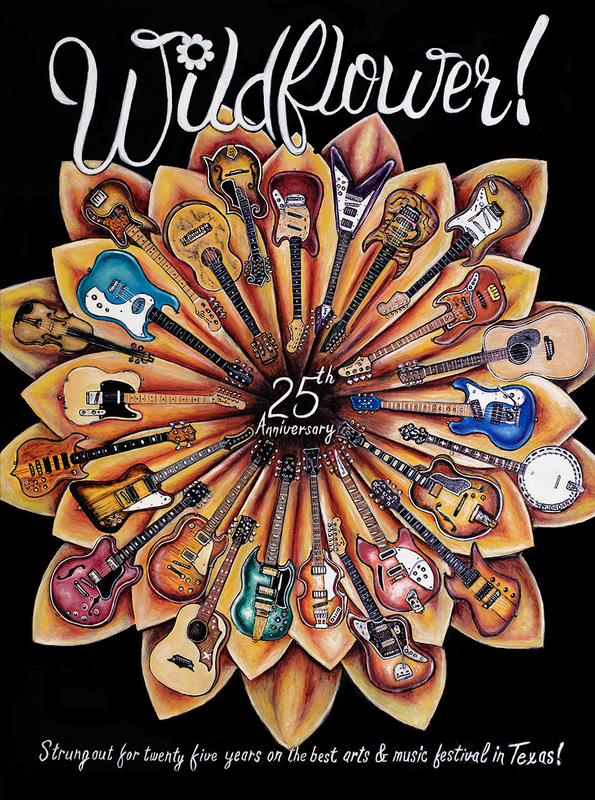 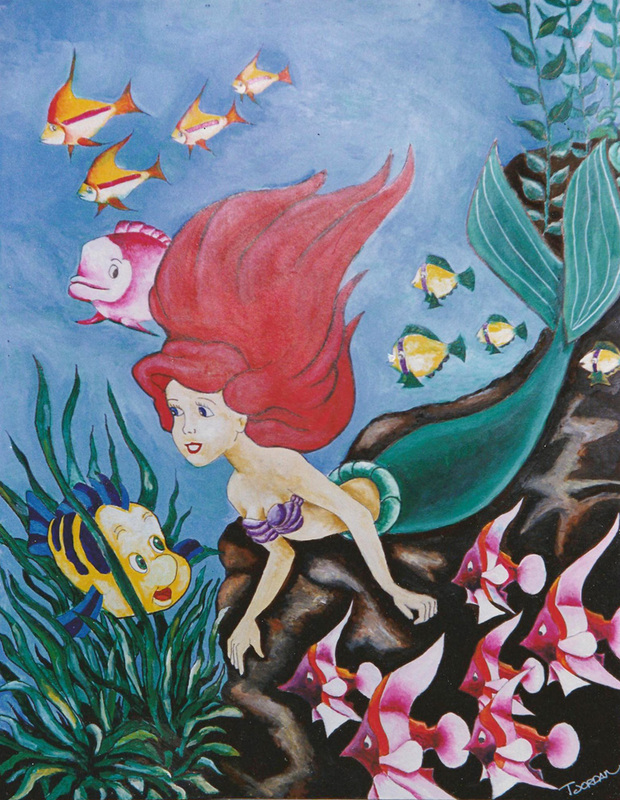 Paper prints are also available on Ebay, Houzz and Etsy. 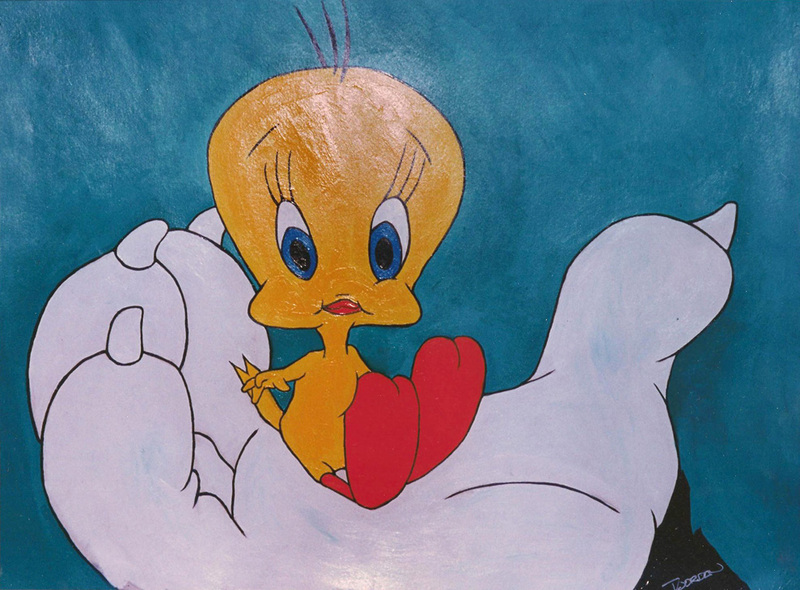 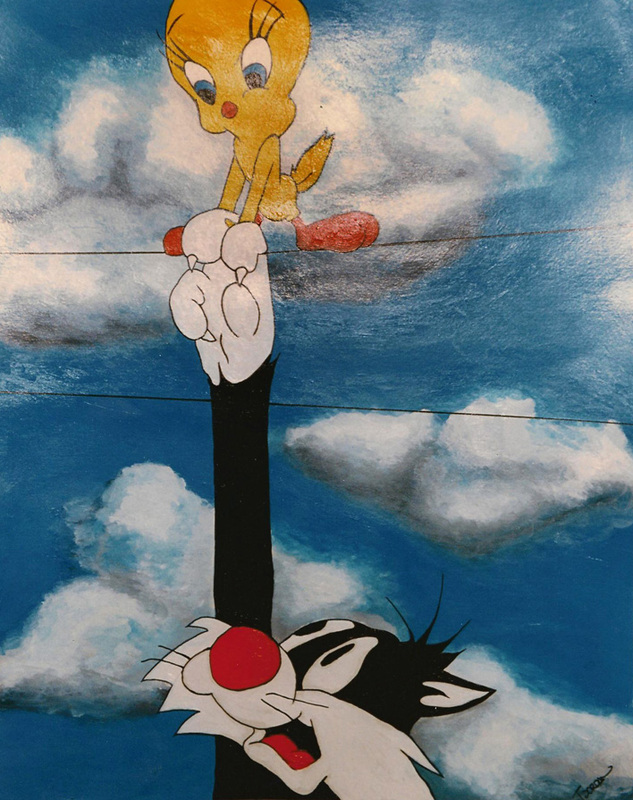 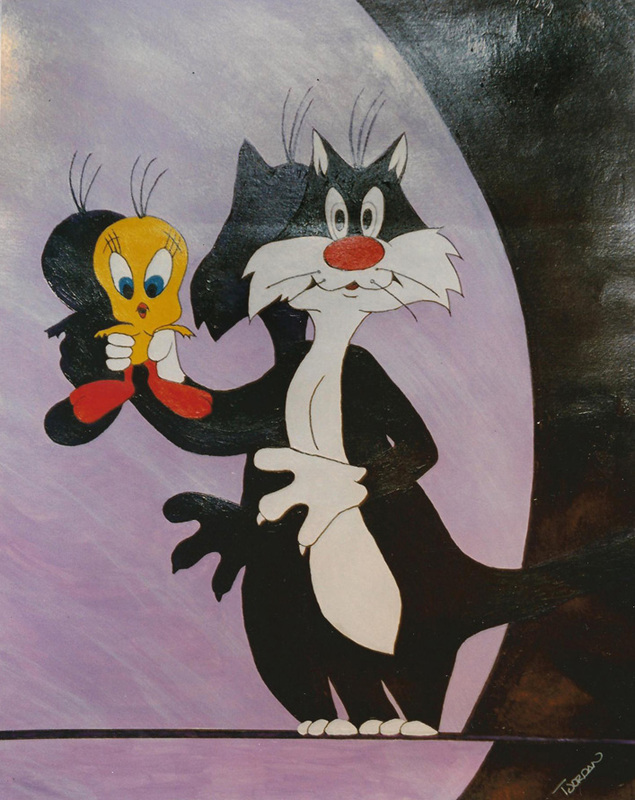 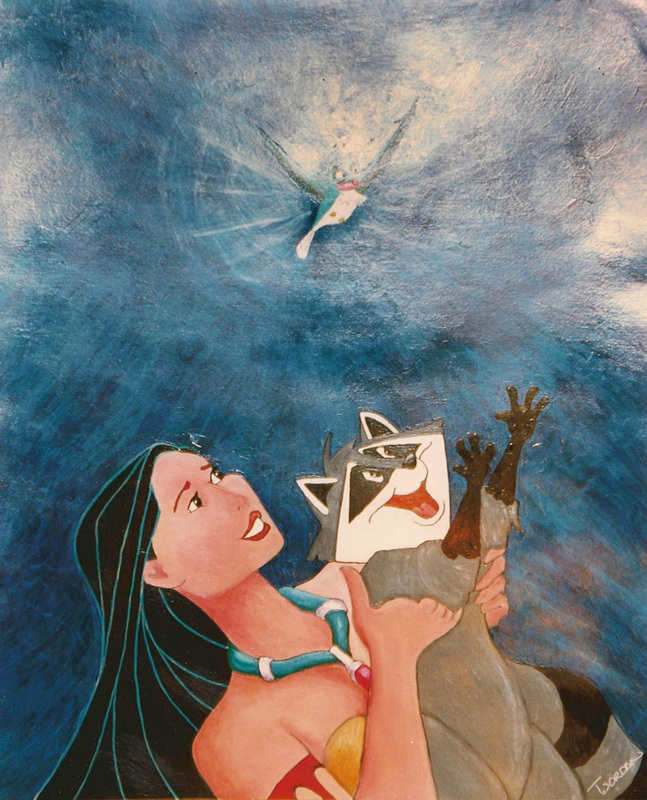 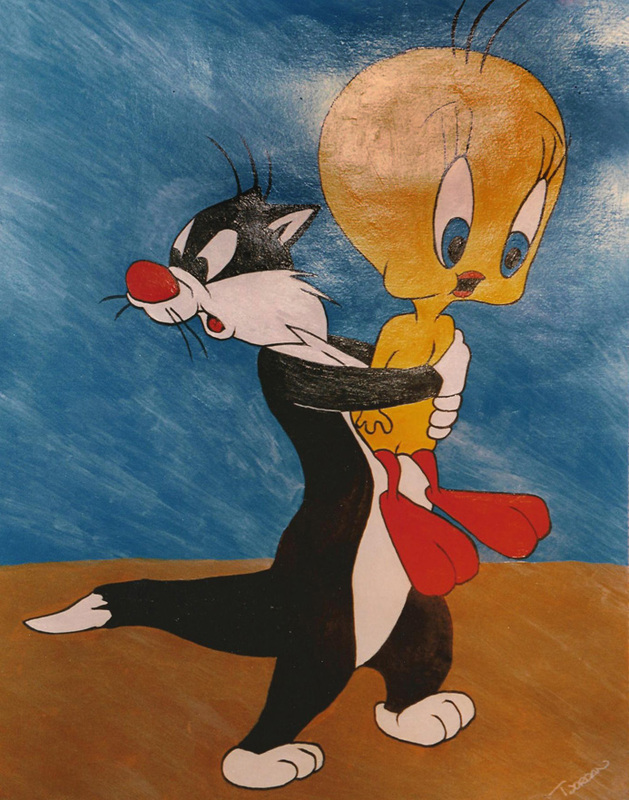 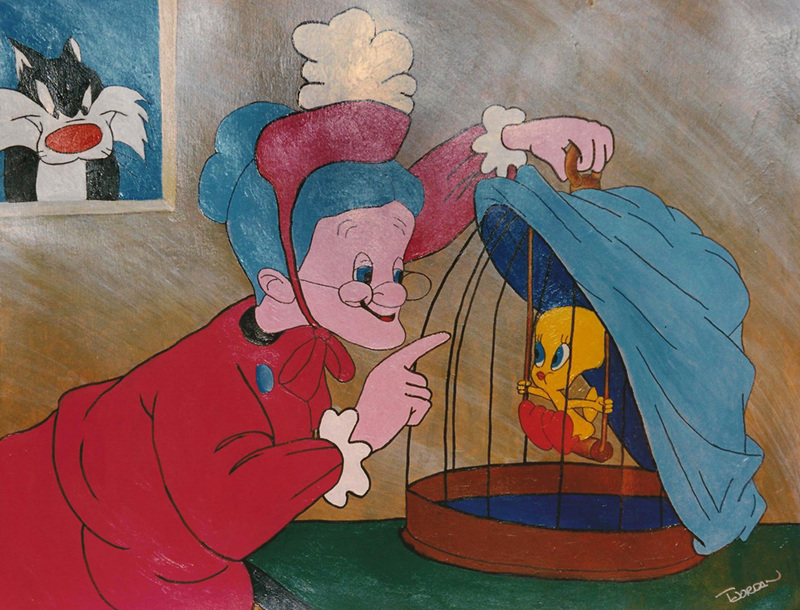 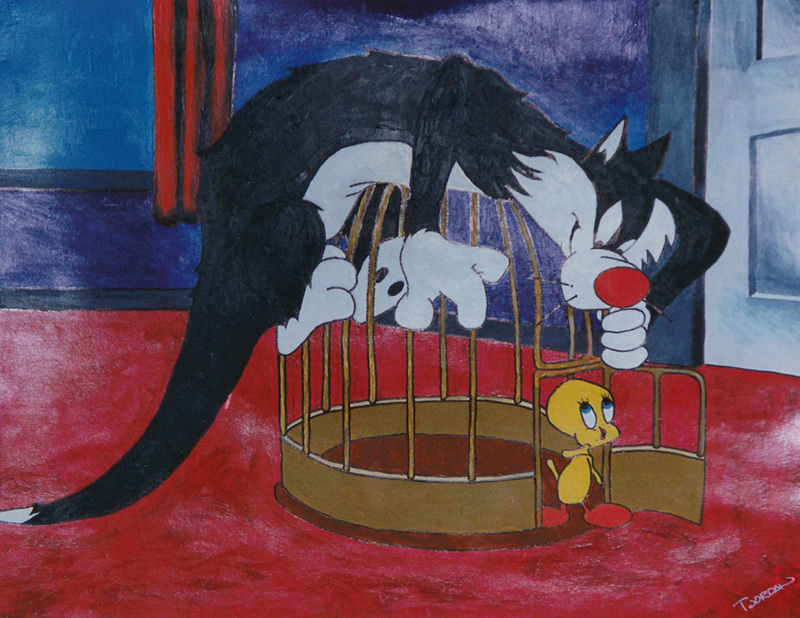 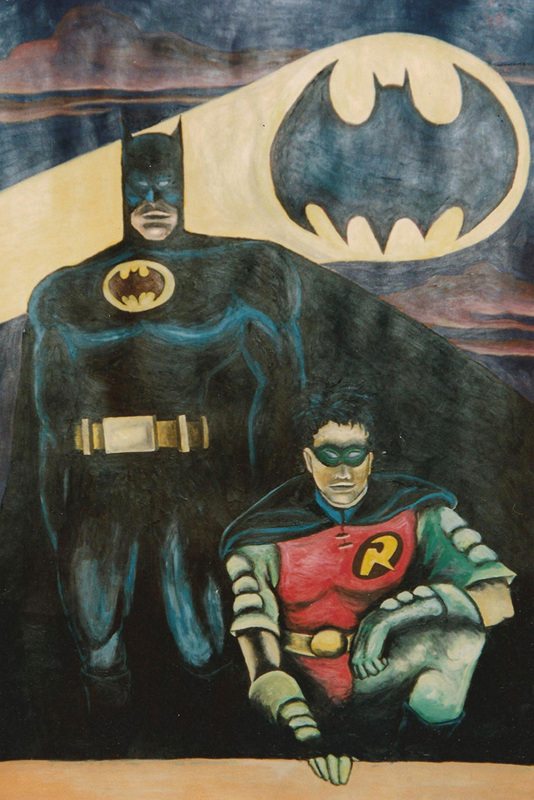 Canvas and paper dimensions are the same as the original paintings. 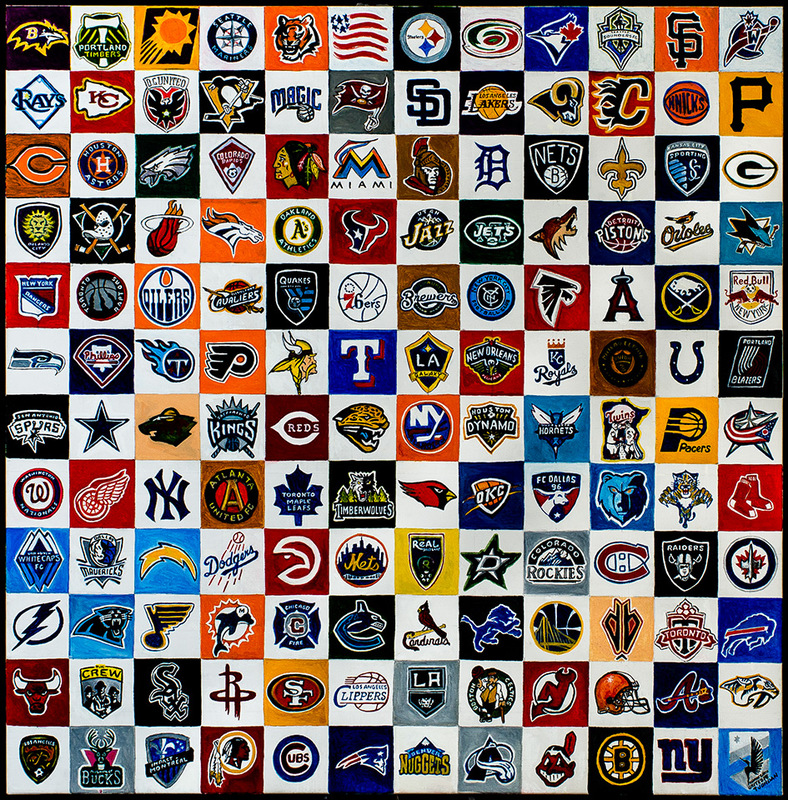 Select any image below to begin sports gallery view. 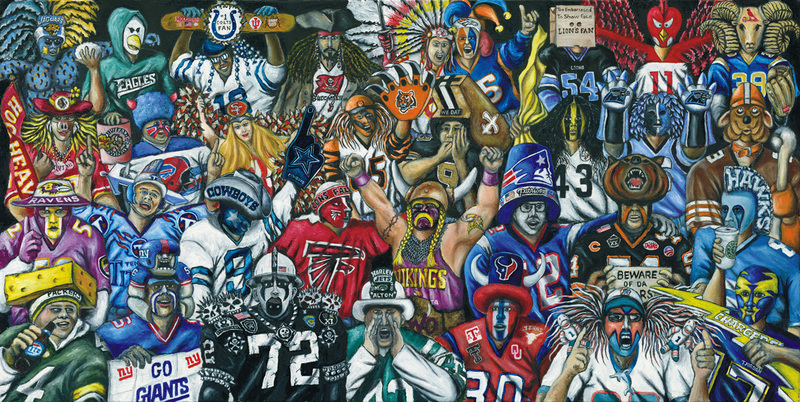 One faithful representative from all 32 NFL football teams. 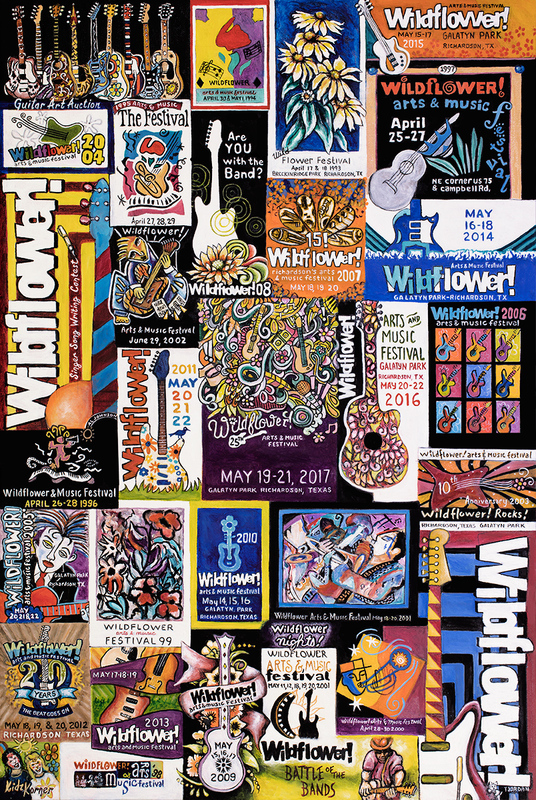 Much of the inspiration found online. 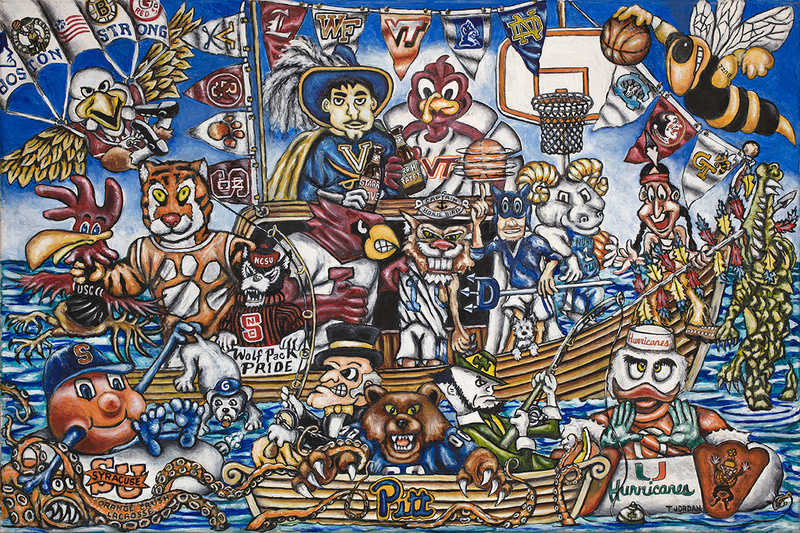 Mascots and fan representatives from top colleges. 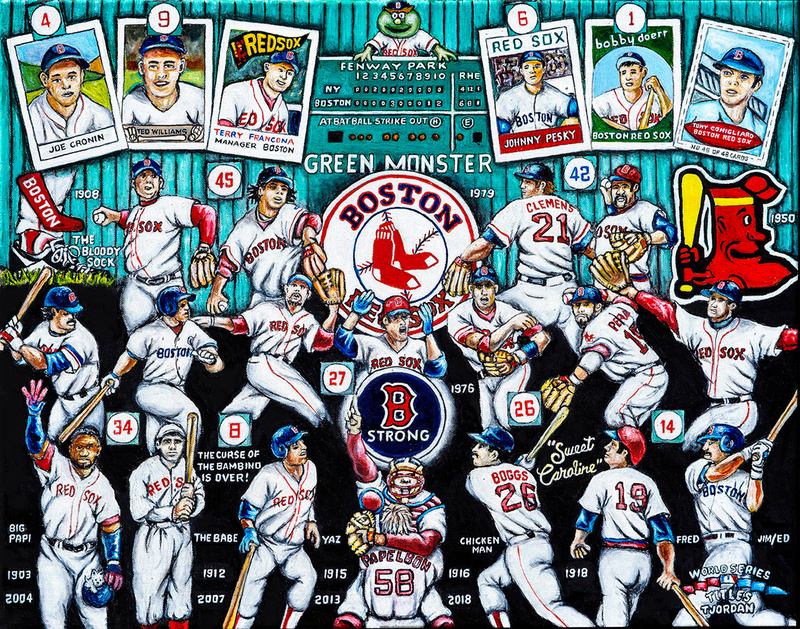 Boston Red Sox MLB Franchise Tribute Painting. 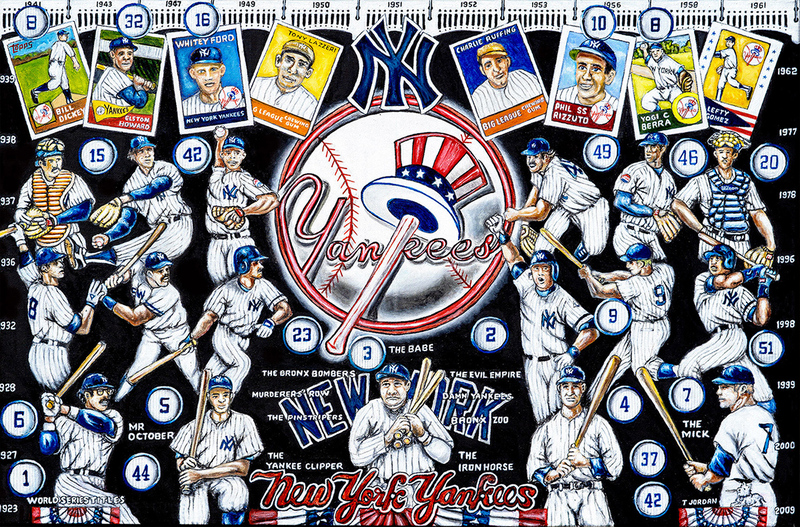 New York Yankees MLB Franchise Tribute Painting. 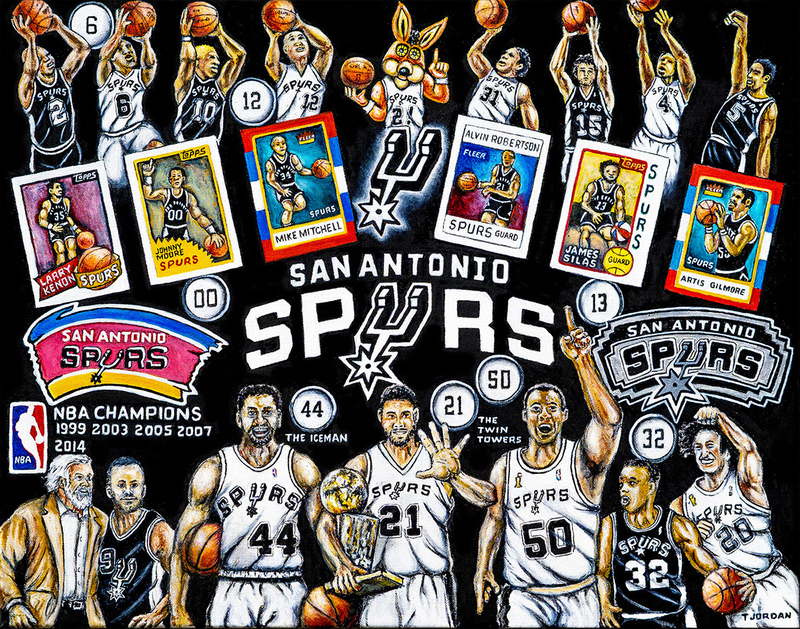 San Antonio Spurs NBA Franchise Tribute Painting. 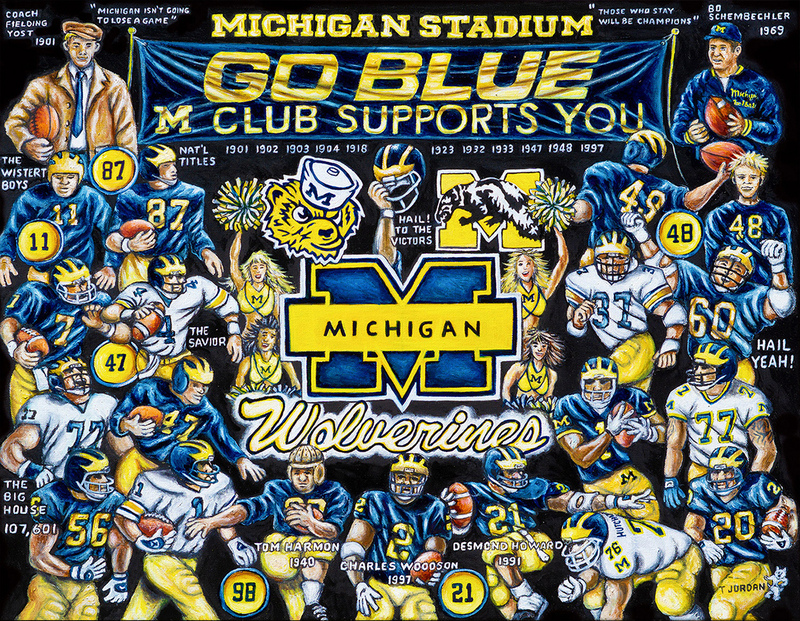 Michigan Wolverines NCAA Football Tribute Painting. 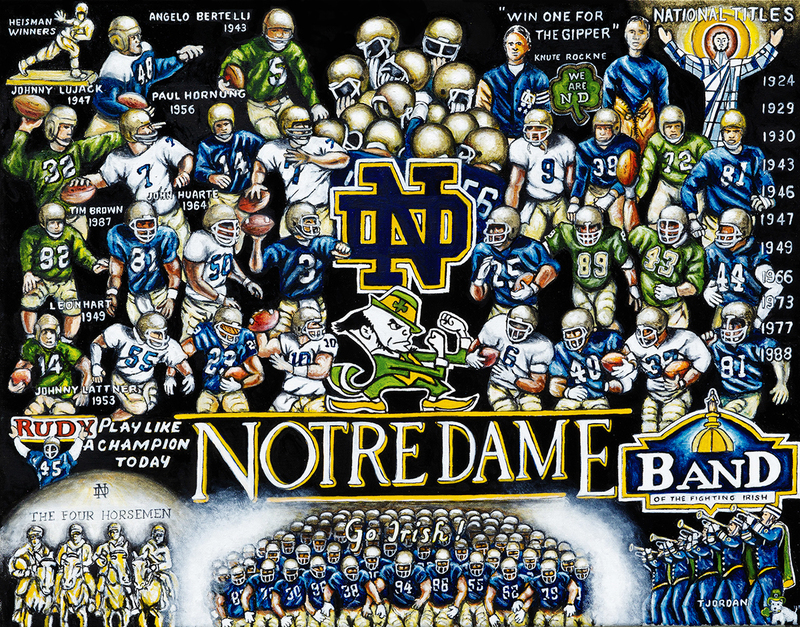 Notre Dame Football Tribute Painting. 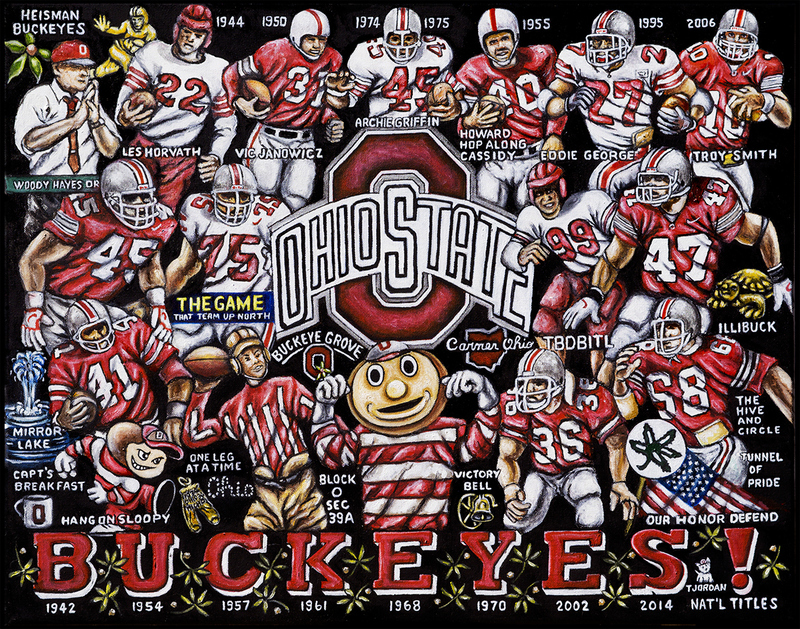 Ohio State Buckeyes Football Tribute Painting. 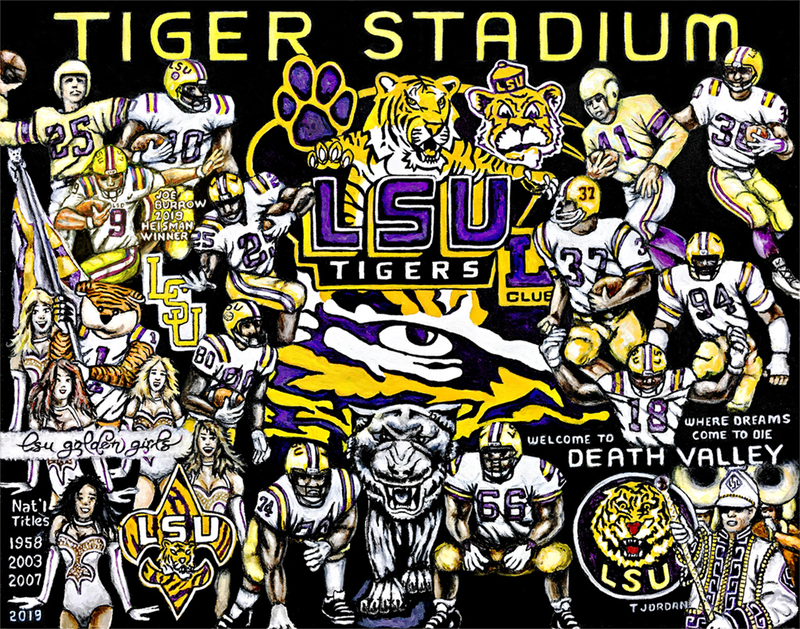 Louisiana State Tigers Football Tribute Painting. 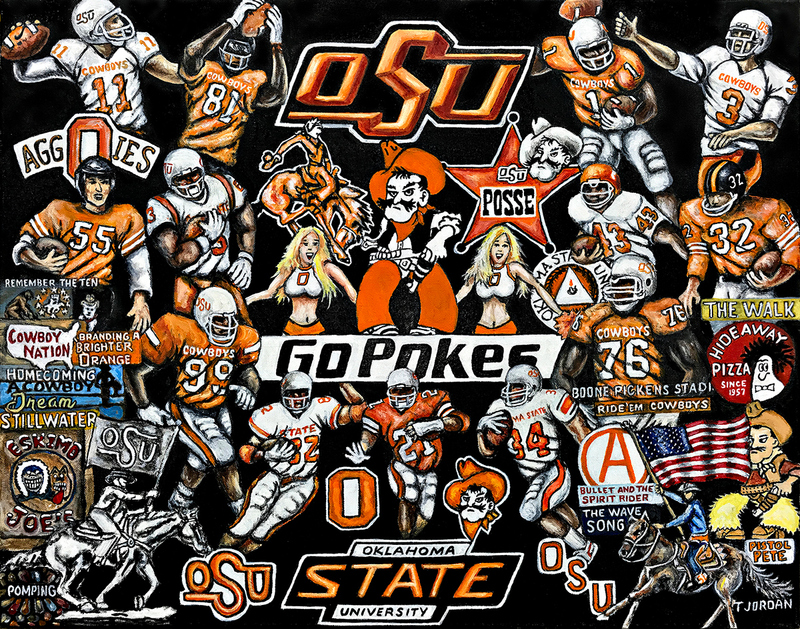 Oklahoma State Cowboys Football Tribute Painting. 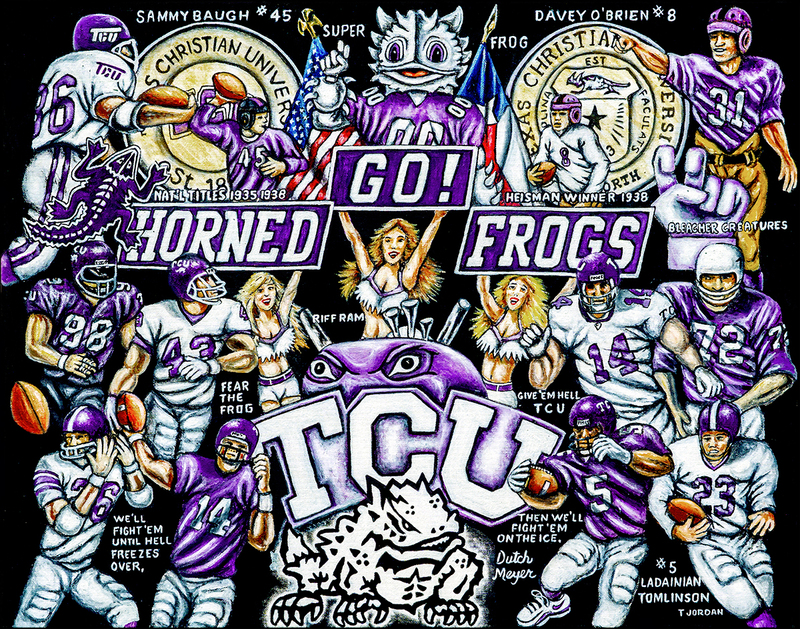 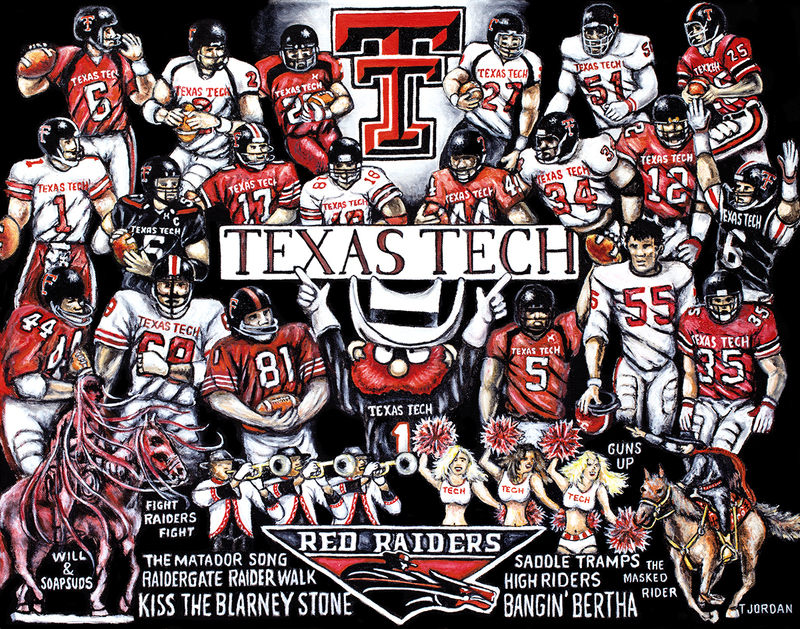 Texas Tech Red Raiders Football Tribute Painting. 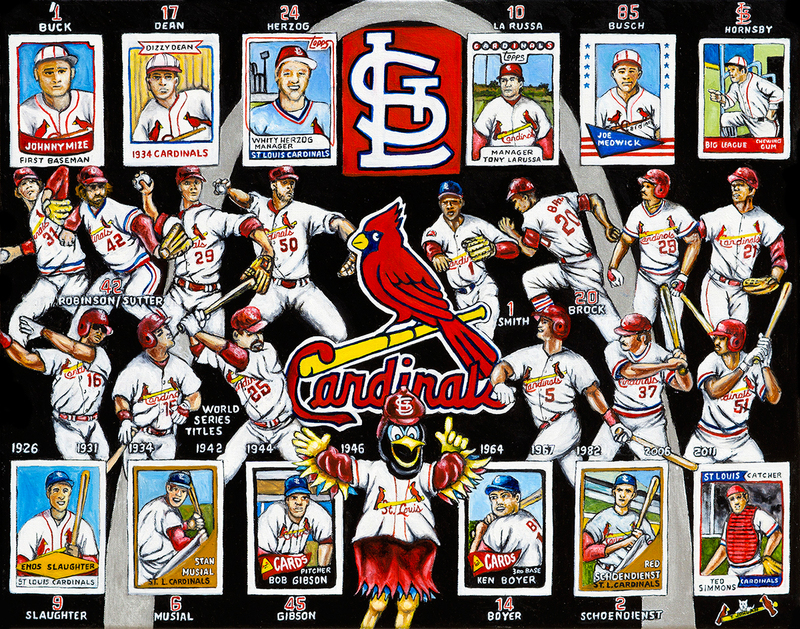 St. Louis Cardinals MLB Franchise Tribute Painting. 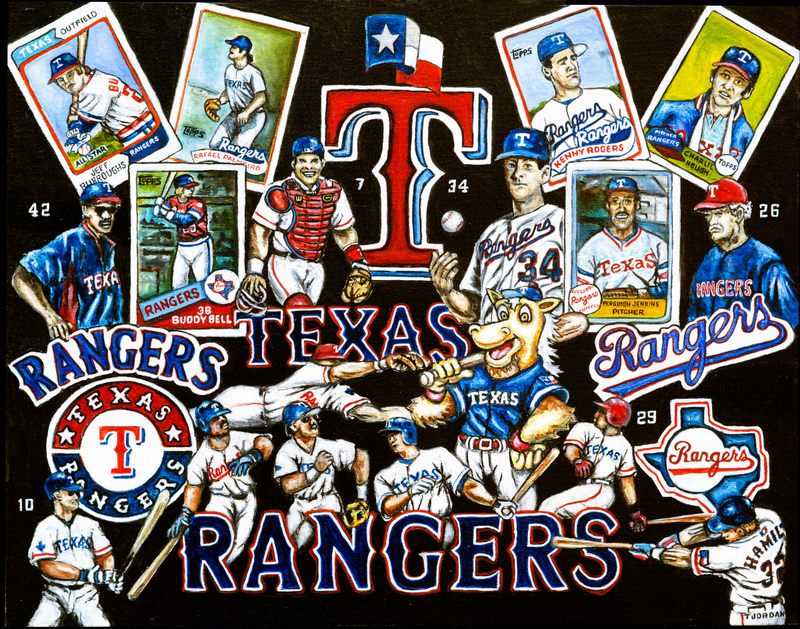 Texas Rangers MLB Franchise Tribute Painting. 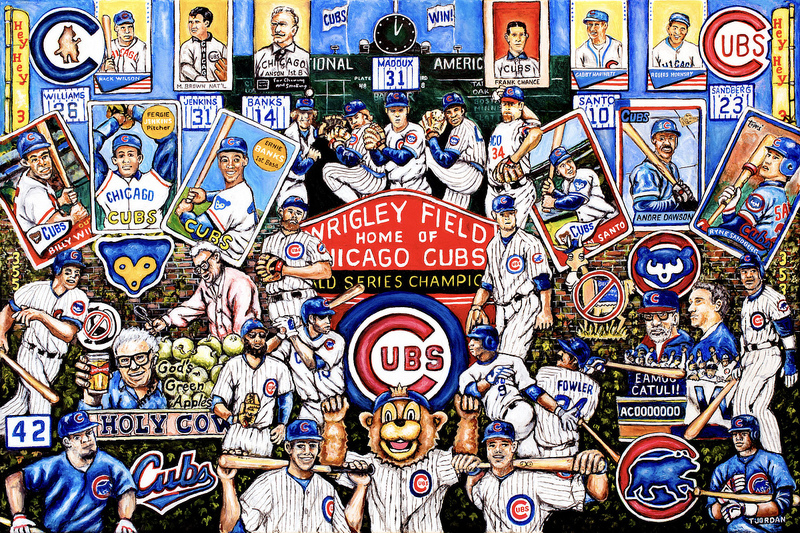 Chicago Cubs Organization Tribute Painting. 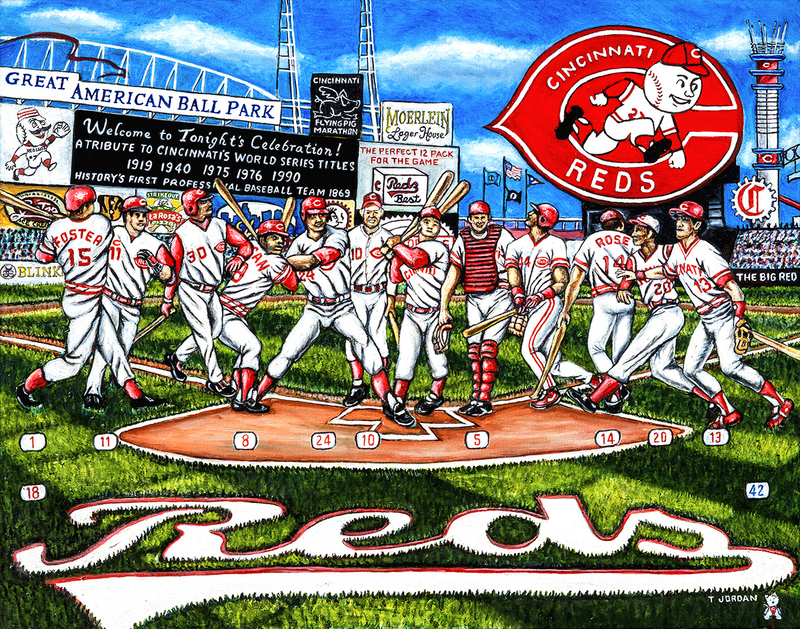 Cincinnati Reds MLB Franchise Tribute Painting. 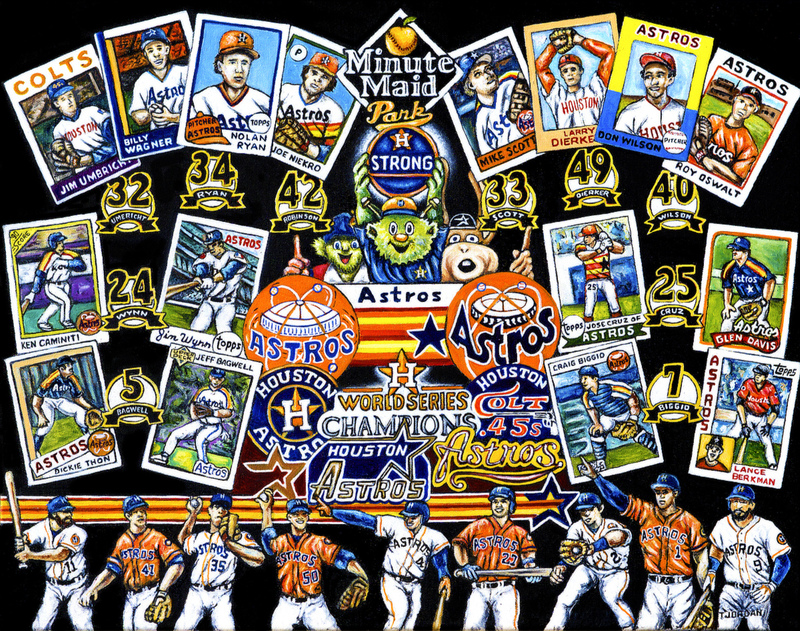 Houston Astros MLB Franchise Tribute Painting. 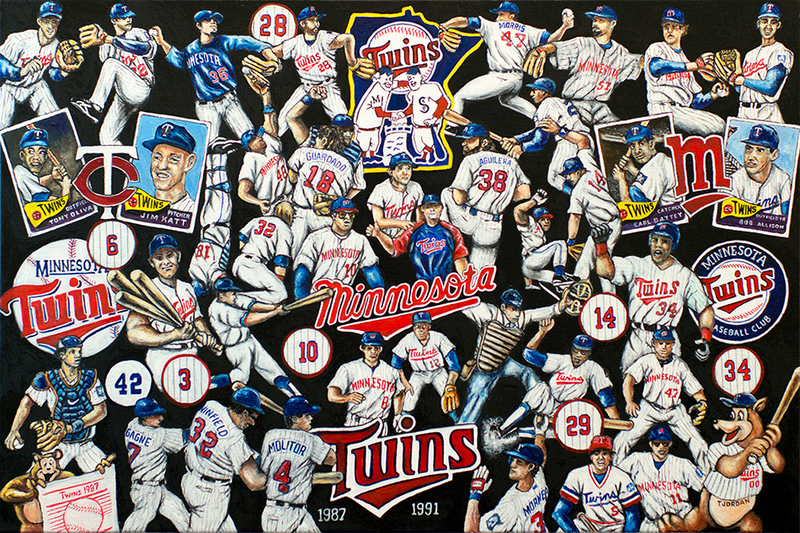 Minnesota Twins MLB Franchise Tribute Painting. 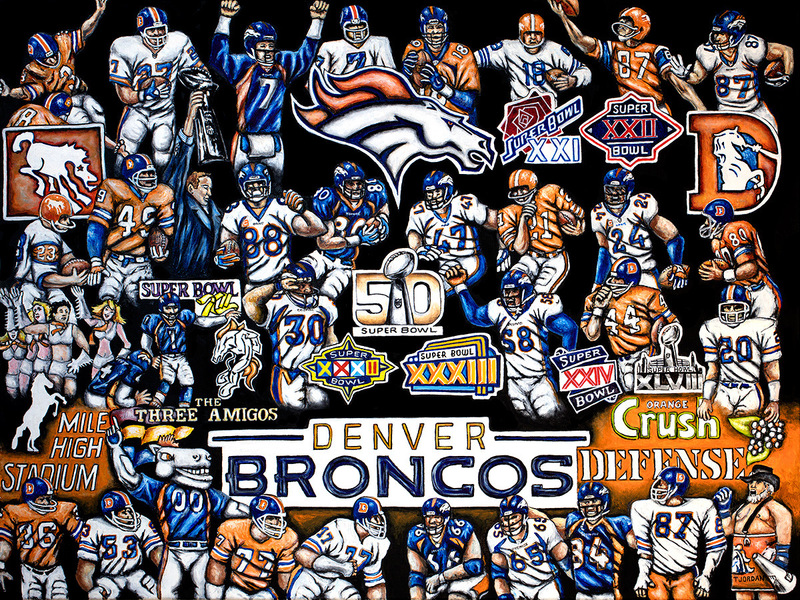 Denver Broncos NFL Team Tribute Painting. 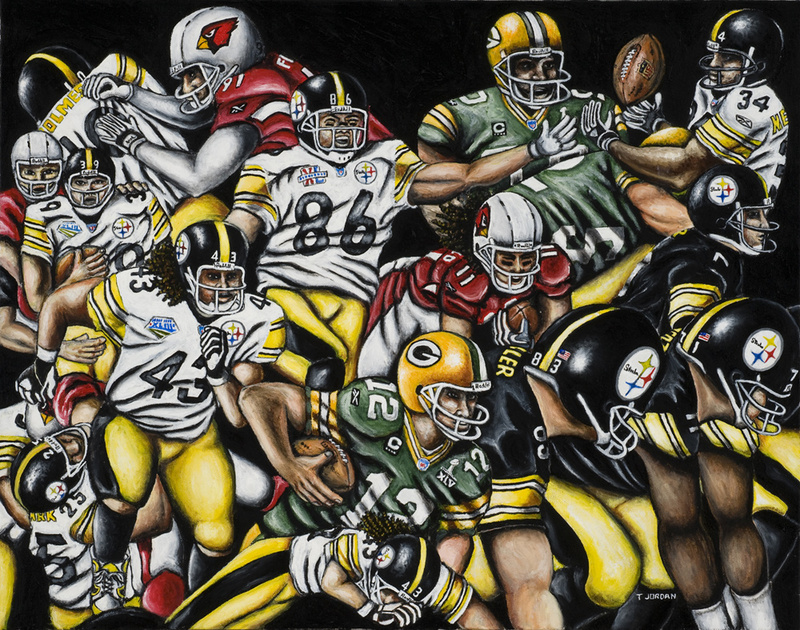 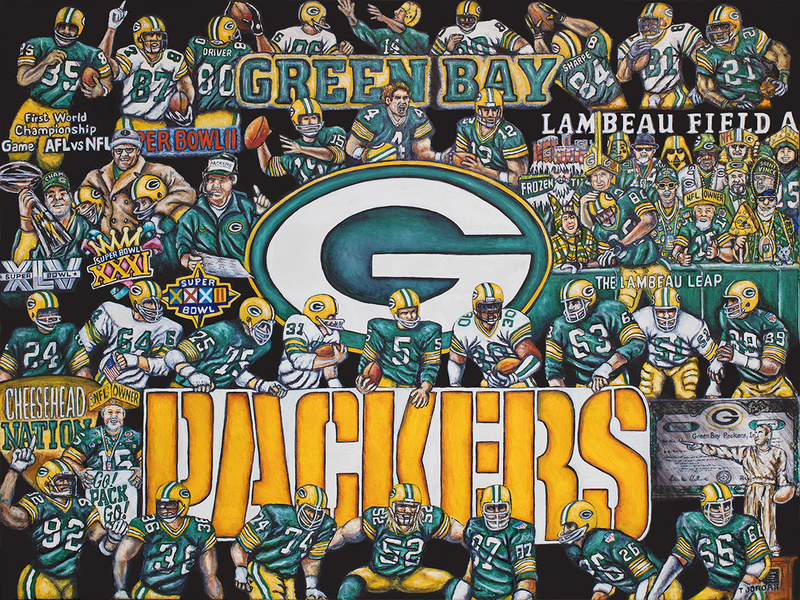 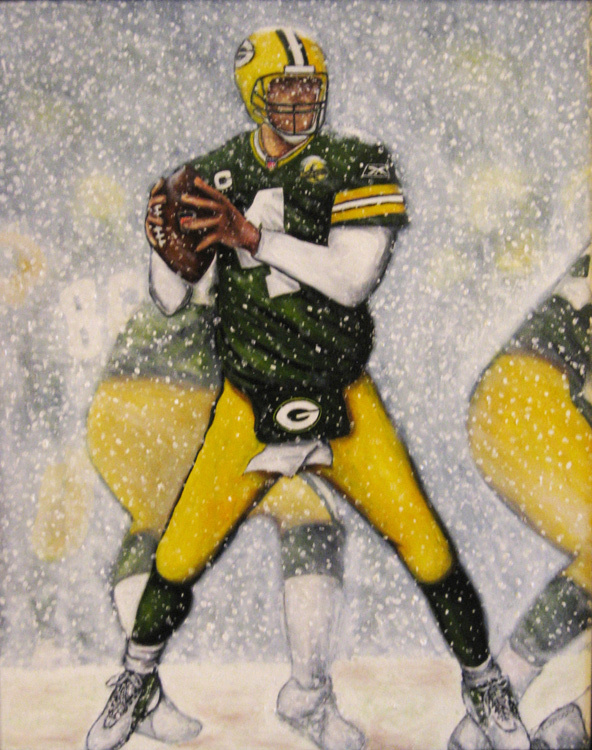 Green Bay Packers NFL Team Tribute Painting. 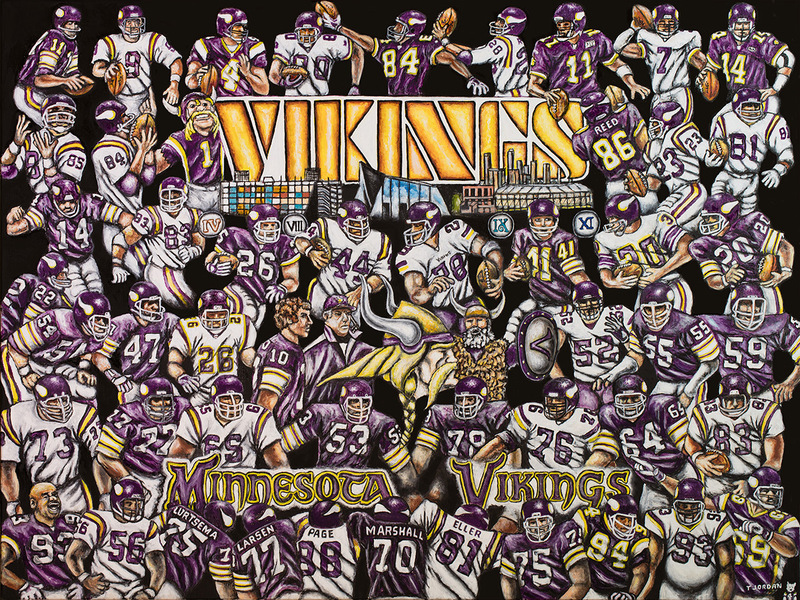 Minnesota Vikings NFL Team Tribute Painting. 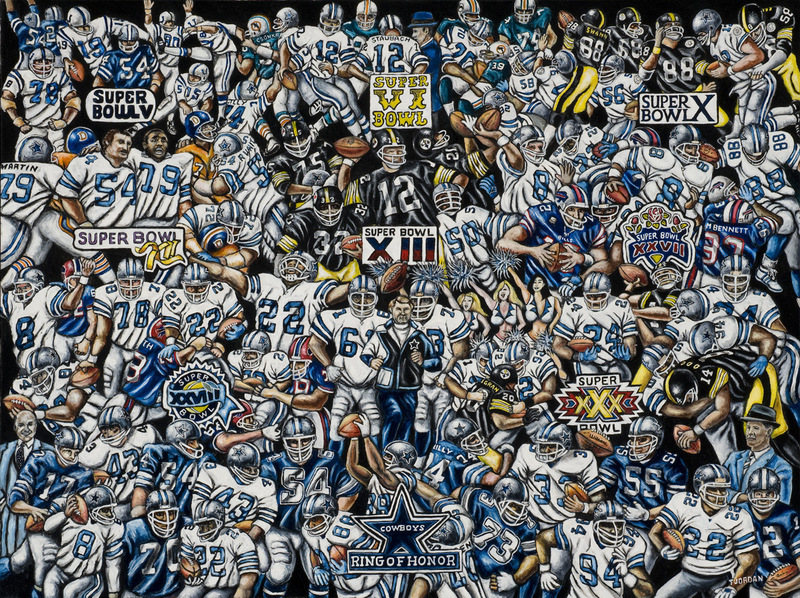 Dallas Cowboys Superbowl Champions Tribute. 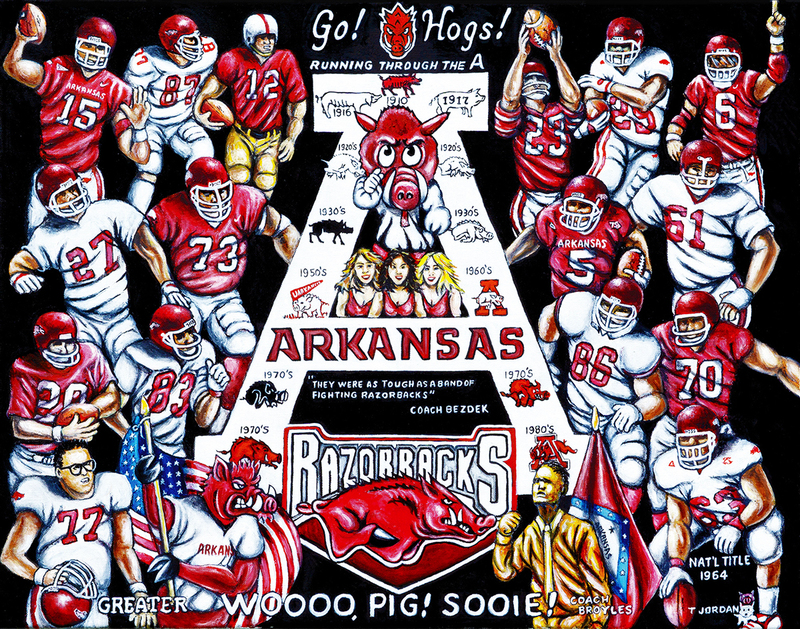 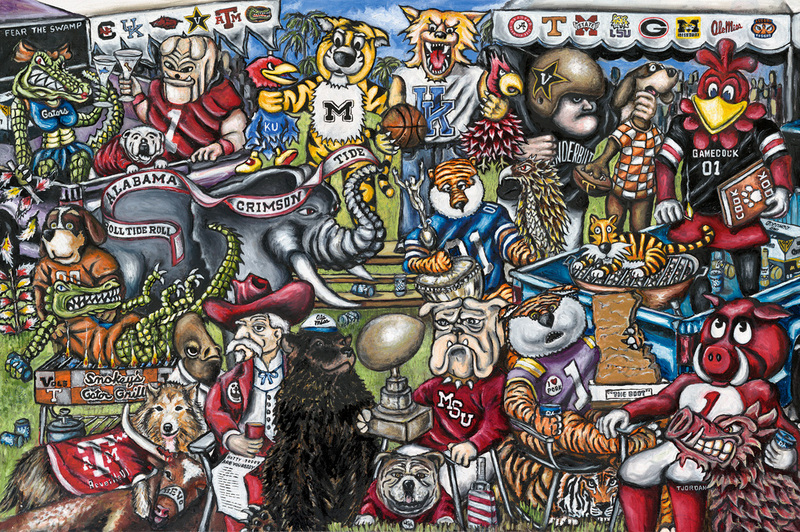 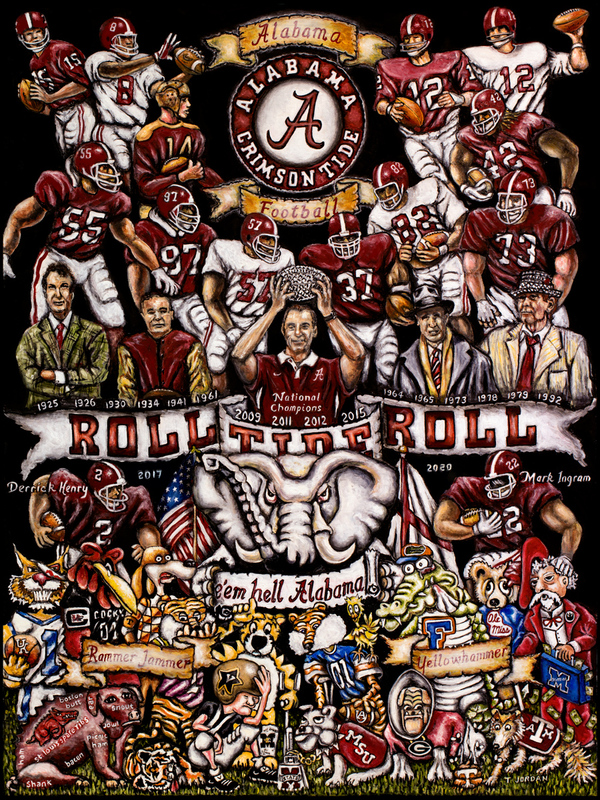 An Alabama Crimson Tide NCAA Football Team Tribute Painting. 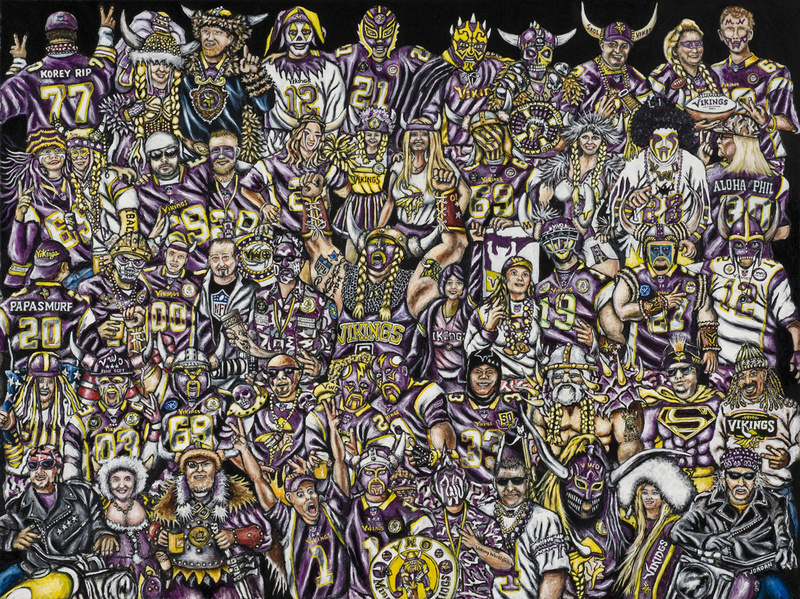 Members of Thee Viking World Order. 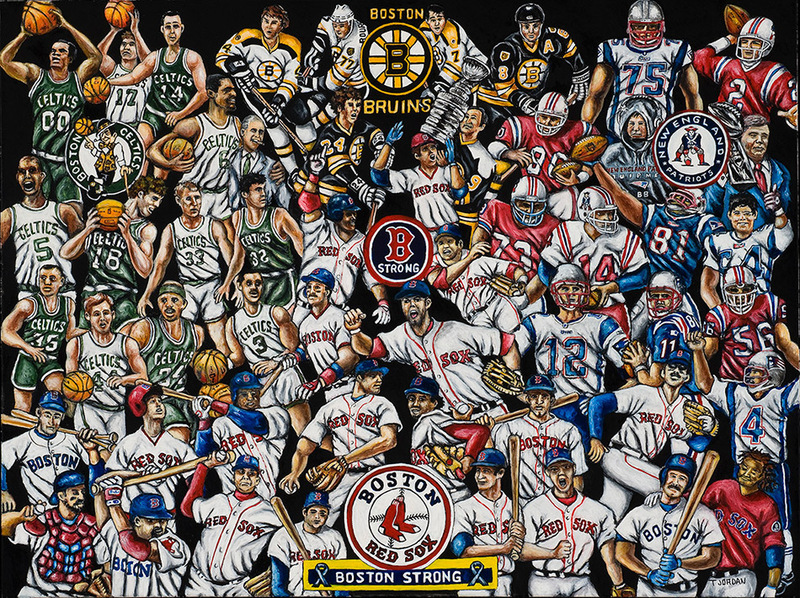 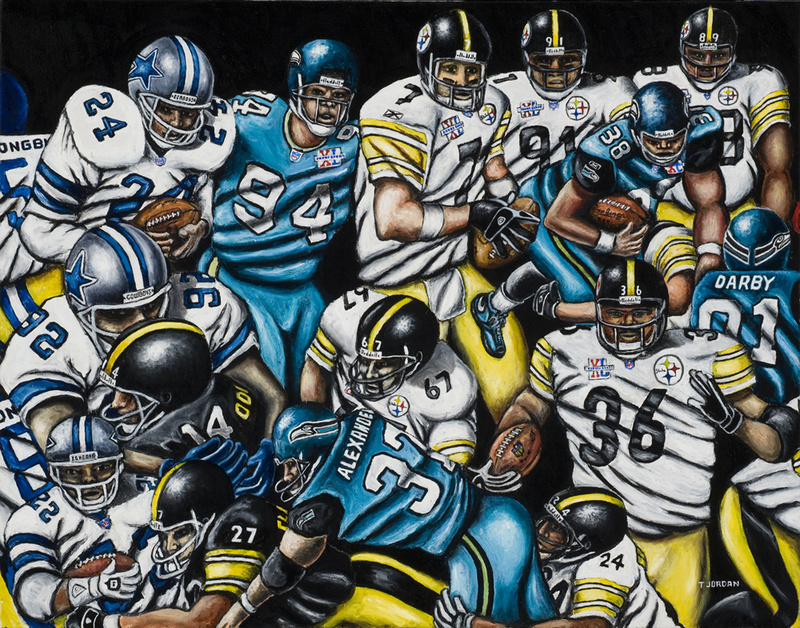 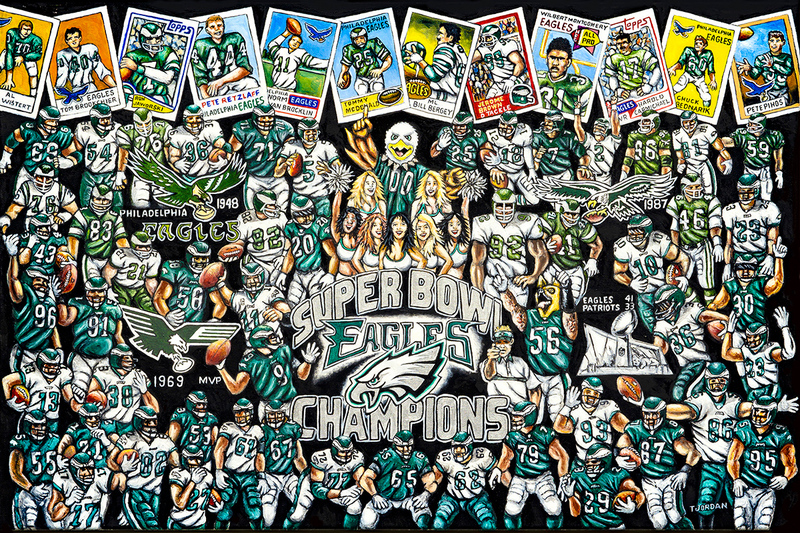 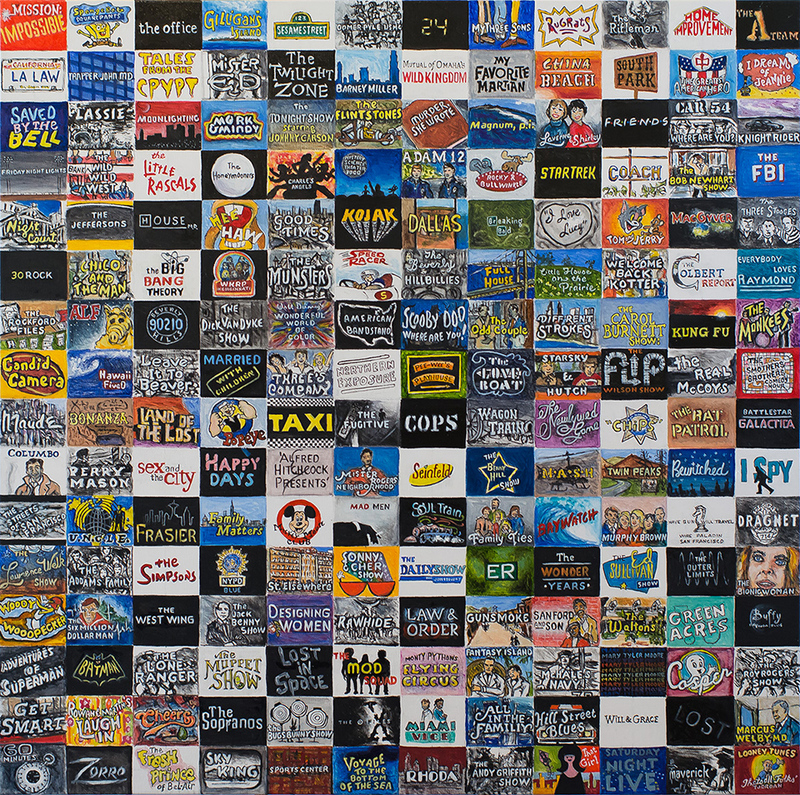 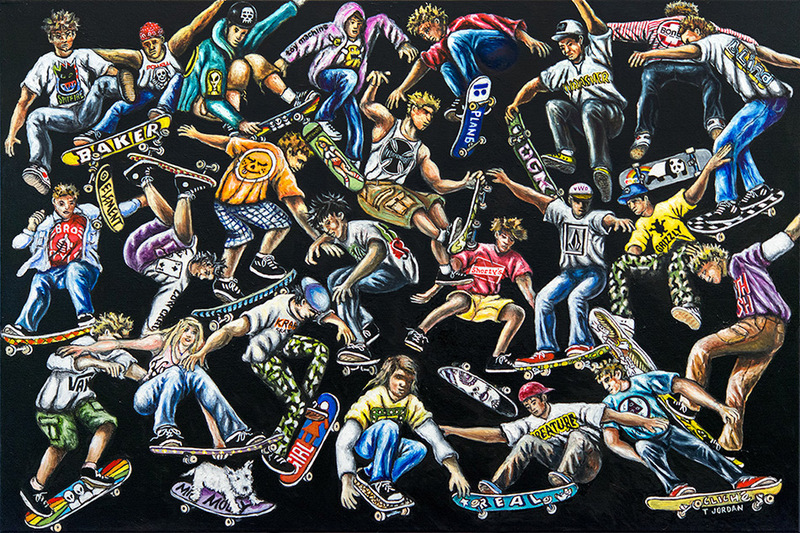 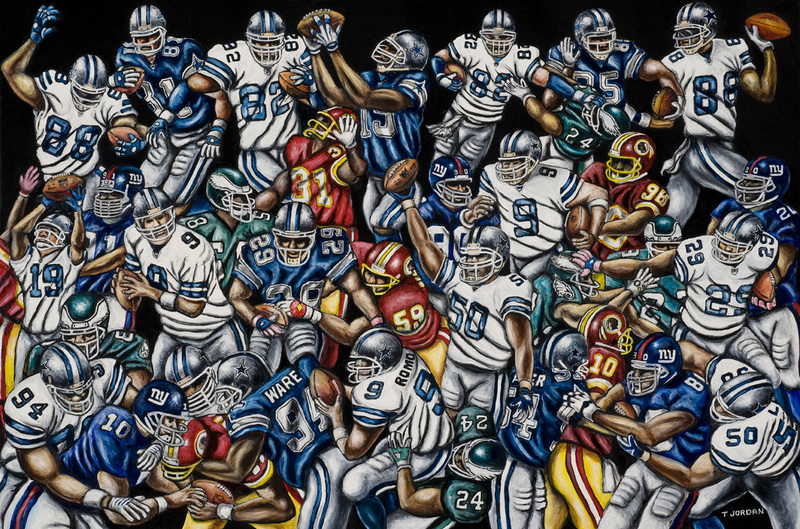 A Great Sports City Tribute Painting. 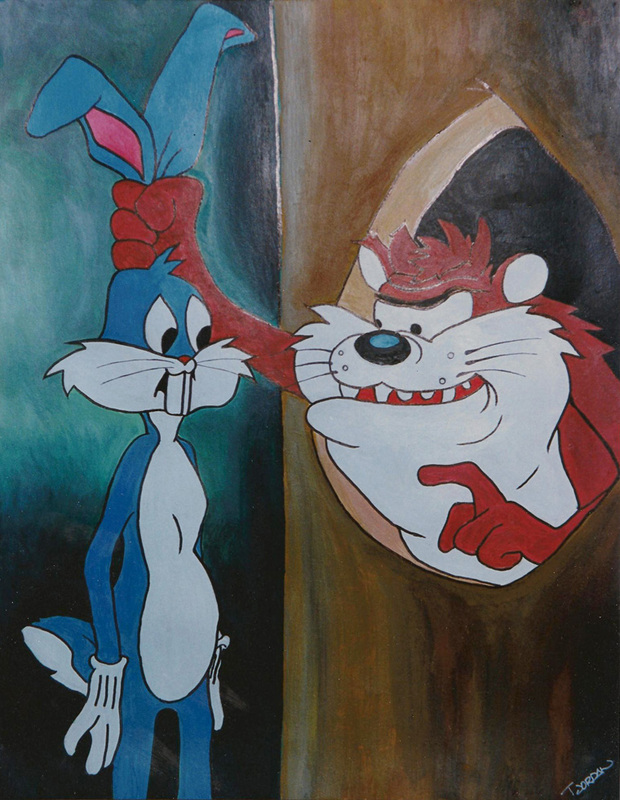 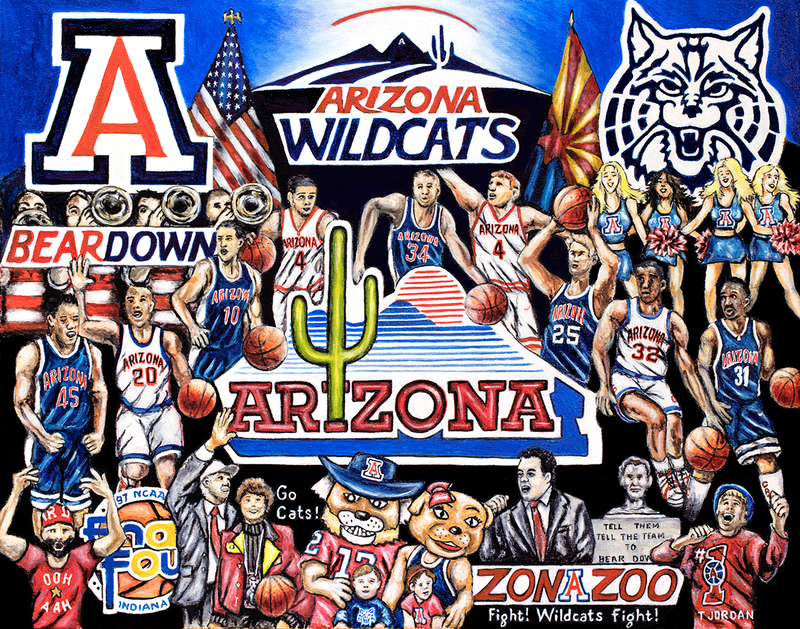 Arizona Wildcat Basketball Tribute Painting. 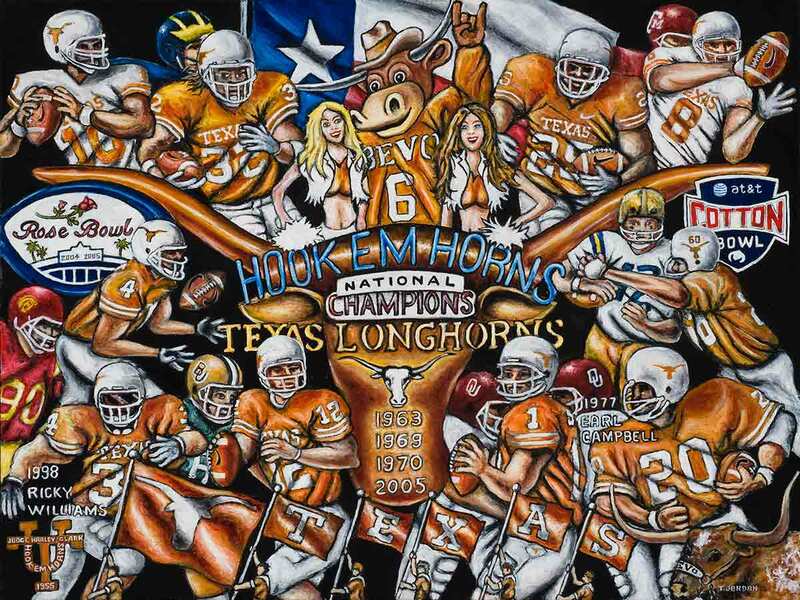 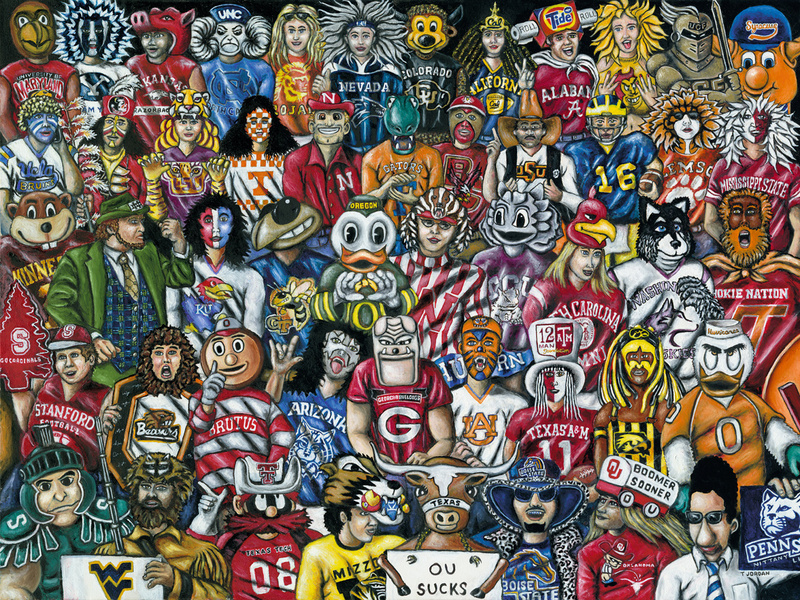 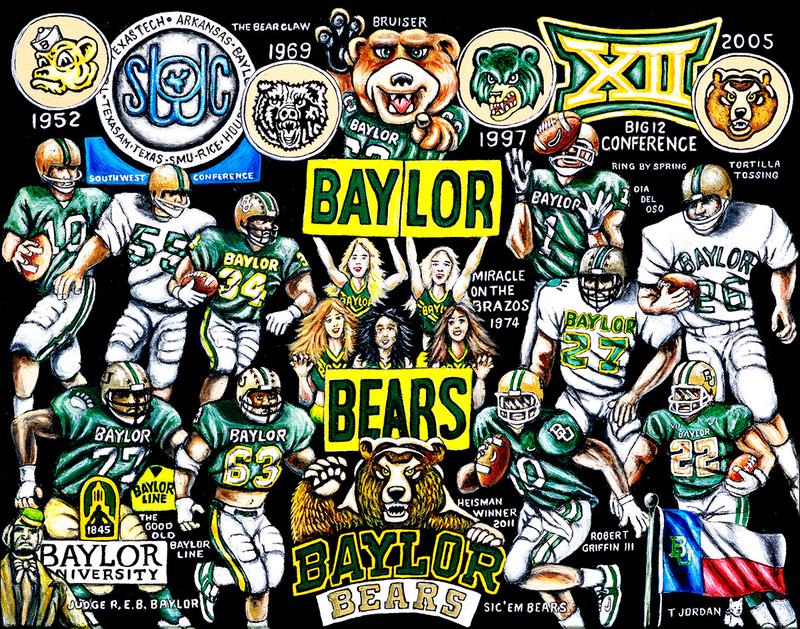 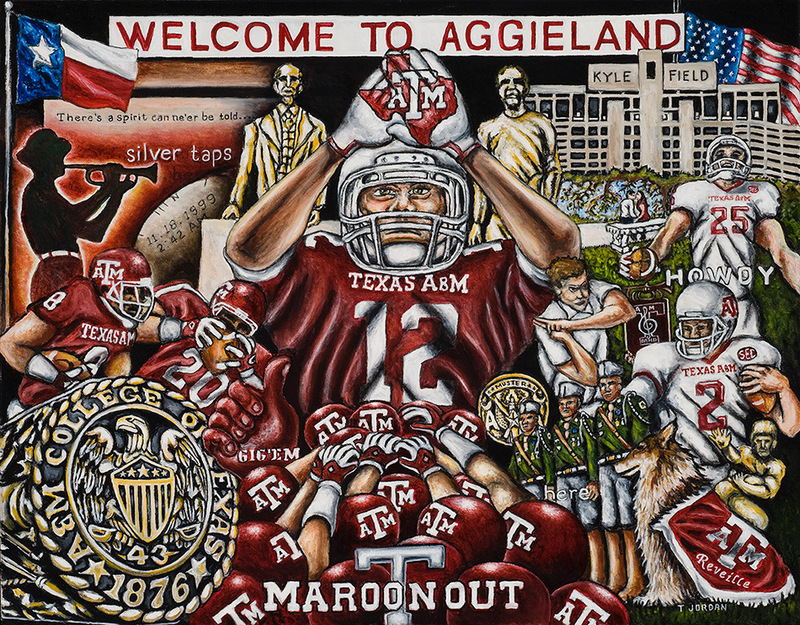 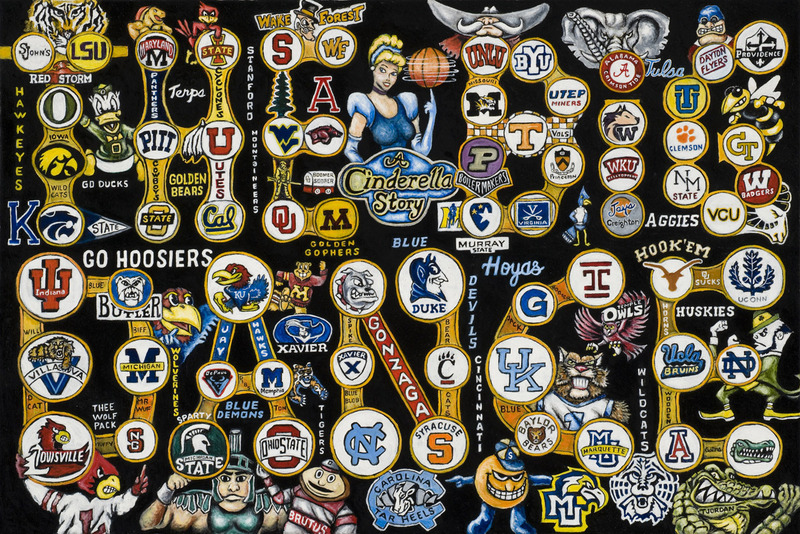 A tribute to all of the powerful division 1 schools of Texas. 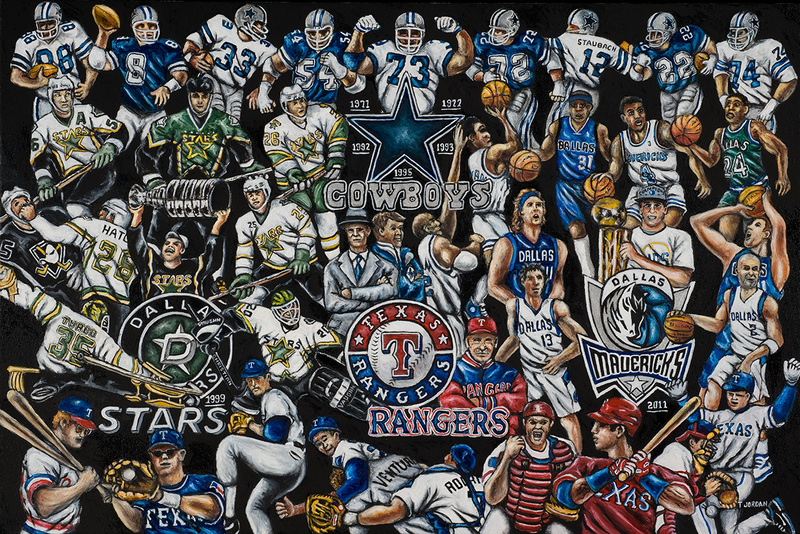 A collage of the current NFL stars that play for Big D.
A fine tribute to who many consider the best professional golfer of all time. 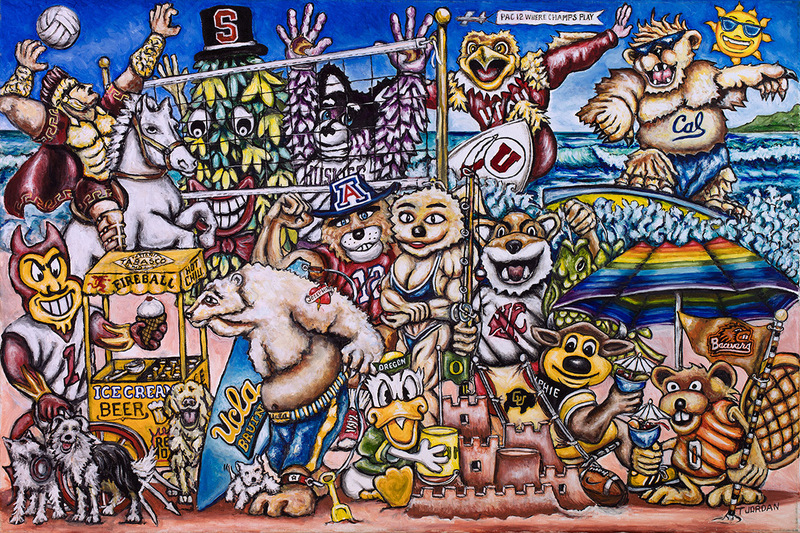 A collage of the top schools invited to the big dance. 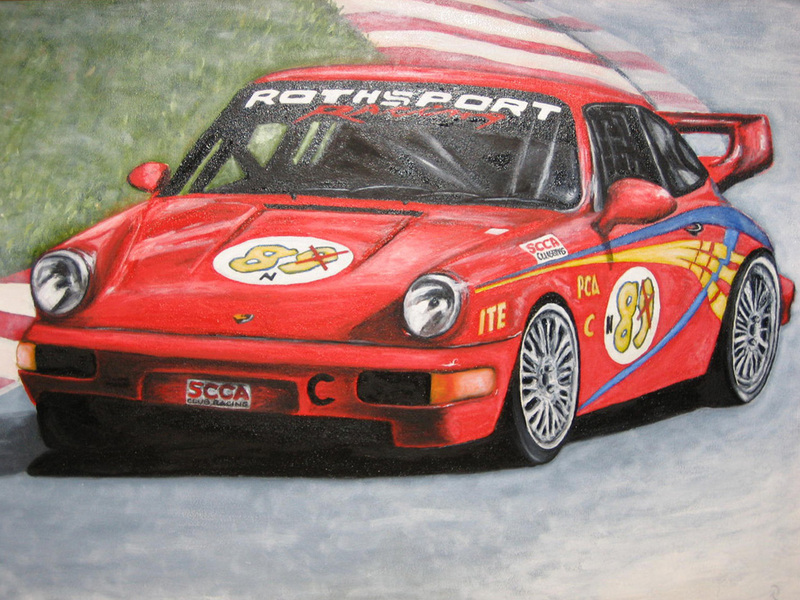 A celebration of the tracks and cars that make NASCAR one of the biggest spectator sports. 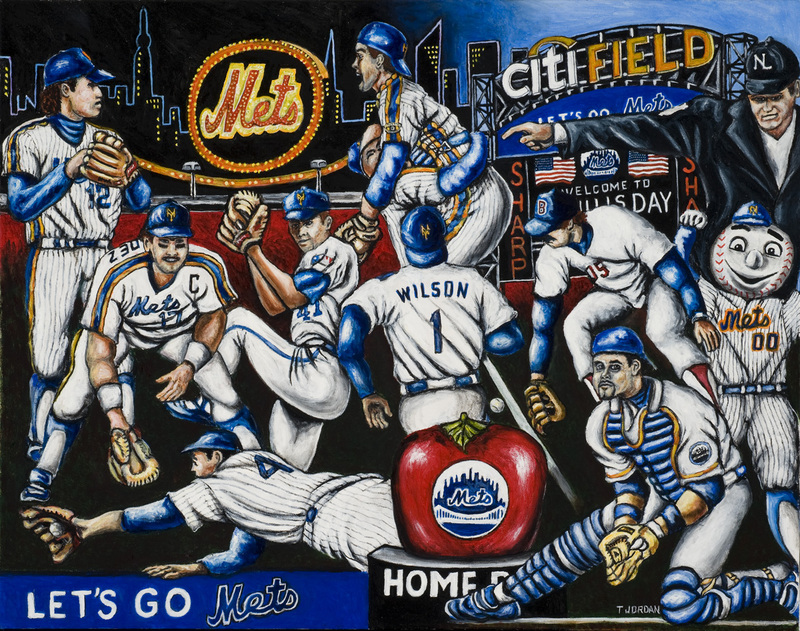 A Gift for the #1 Mets fan in the country. 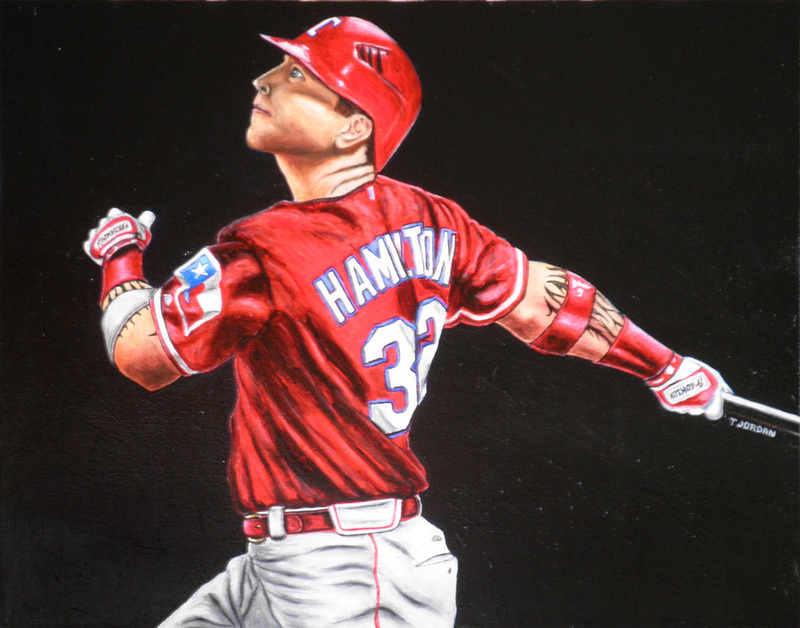 Josh Hamilton -- Texas Rangers. 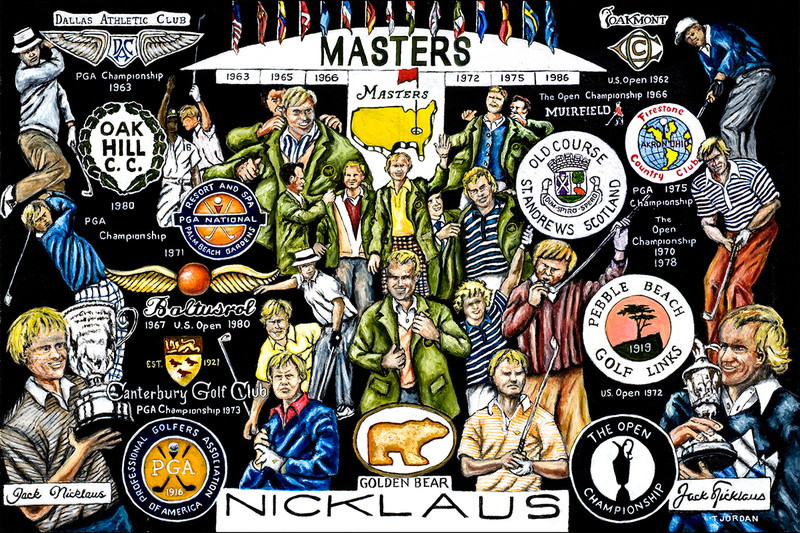 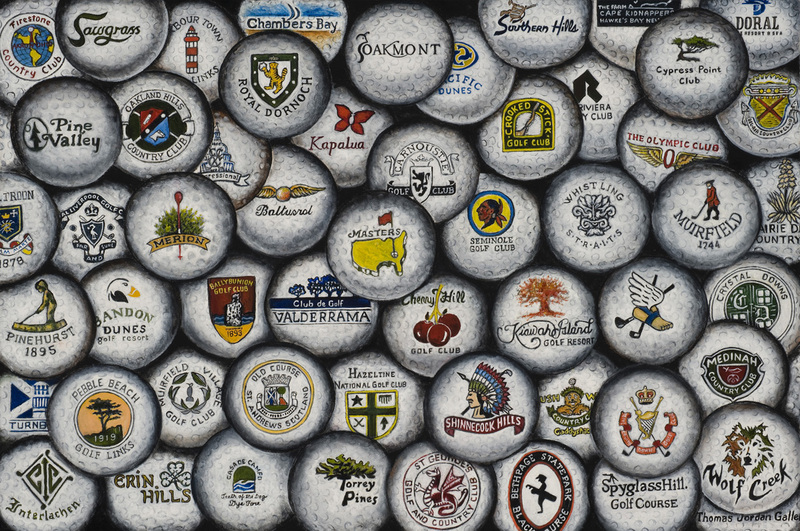 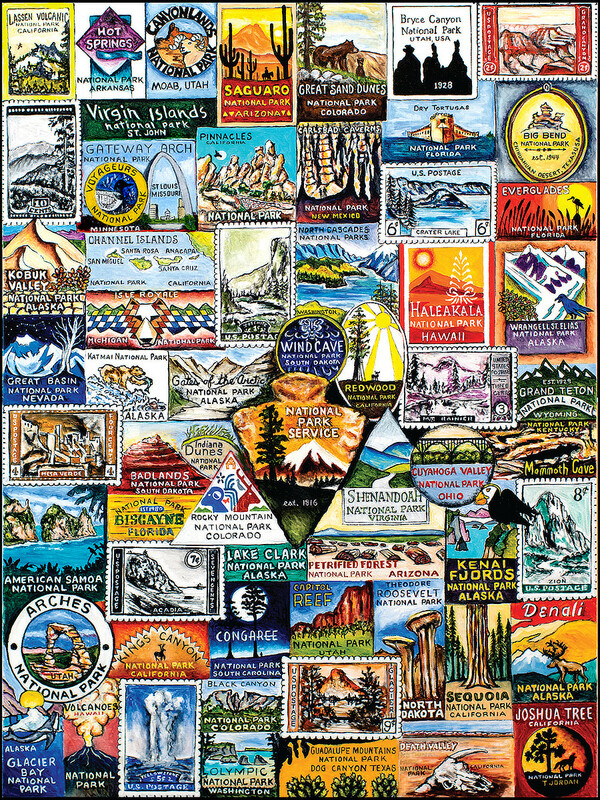 A compilation of logos of well known courses from around the world. 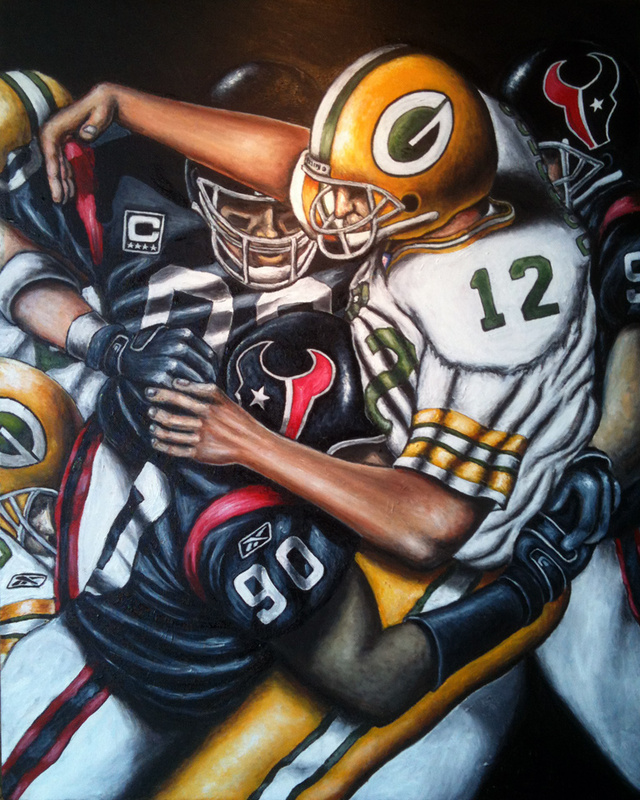 Houston Texans vs. Green Bay Packers. 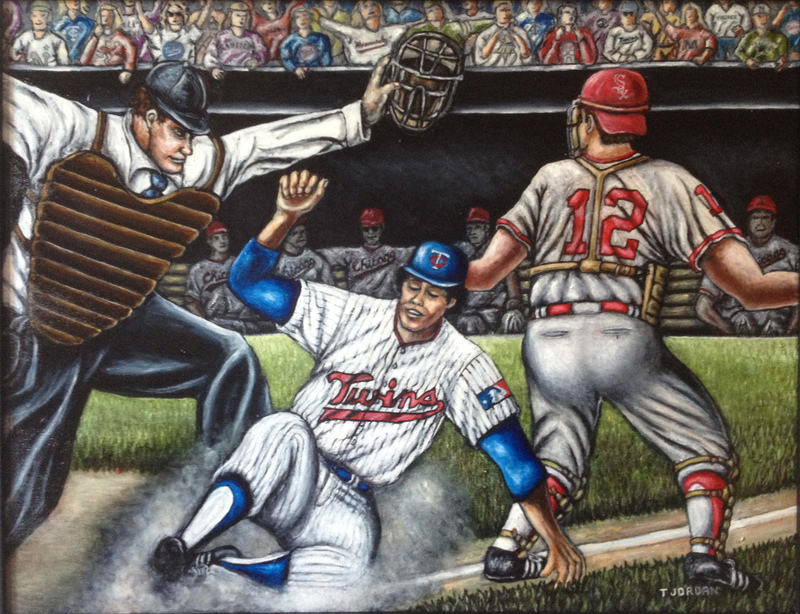 Rod Carew stealing home for the seventh time in 1969. 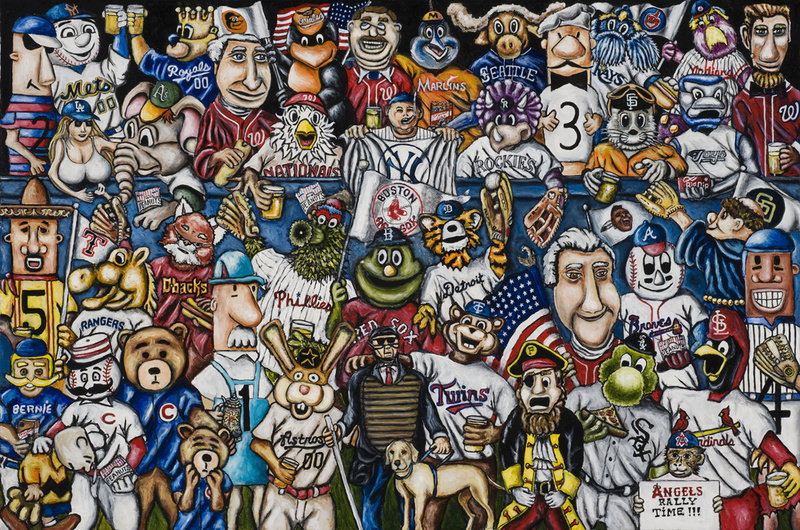 The vision of a lifelong Minnesota Twins and Rod Carew fan. 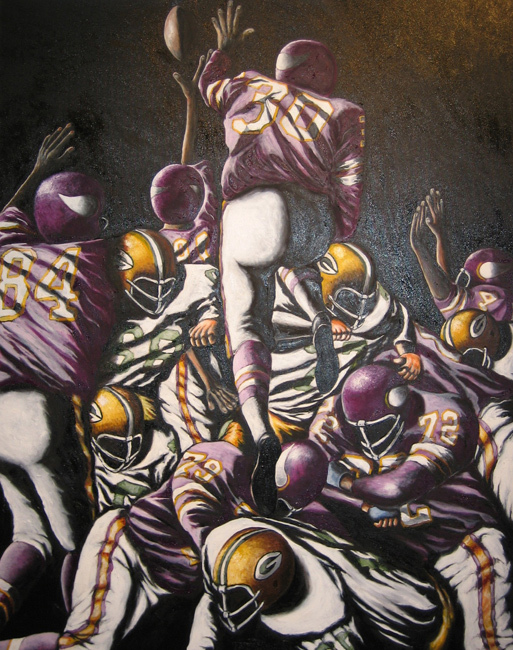 Minnesota Vikings vs. Green Bay Packers. 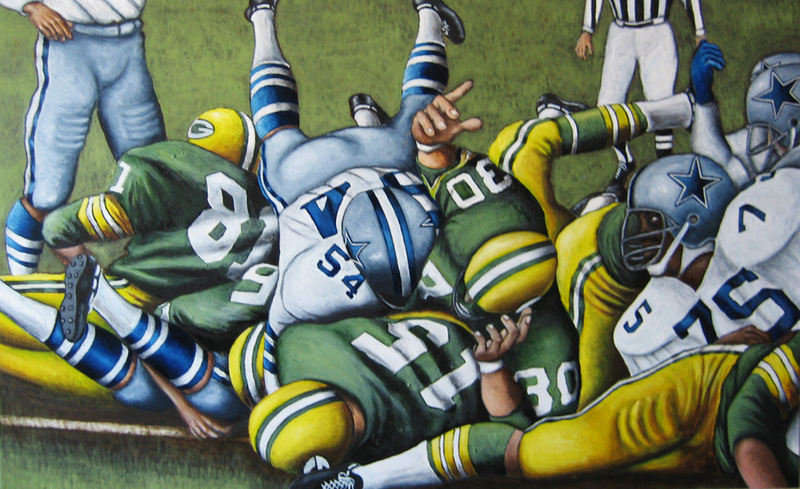 Green Bay Packers vs. Dallas Cowboys. 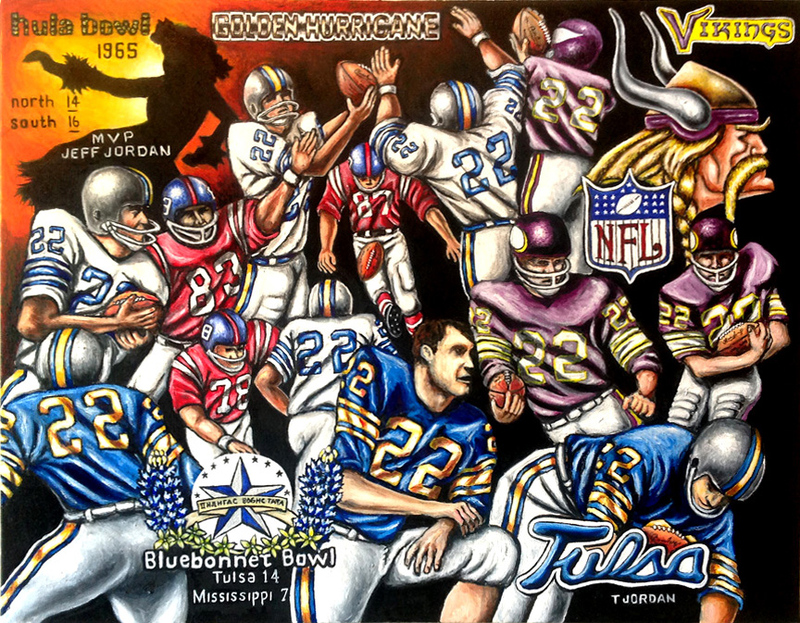 Dallas Cowboys vs. New York Giants. 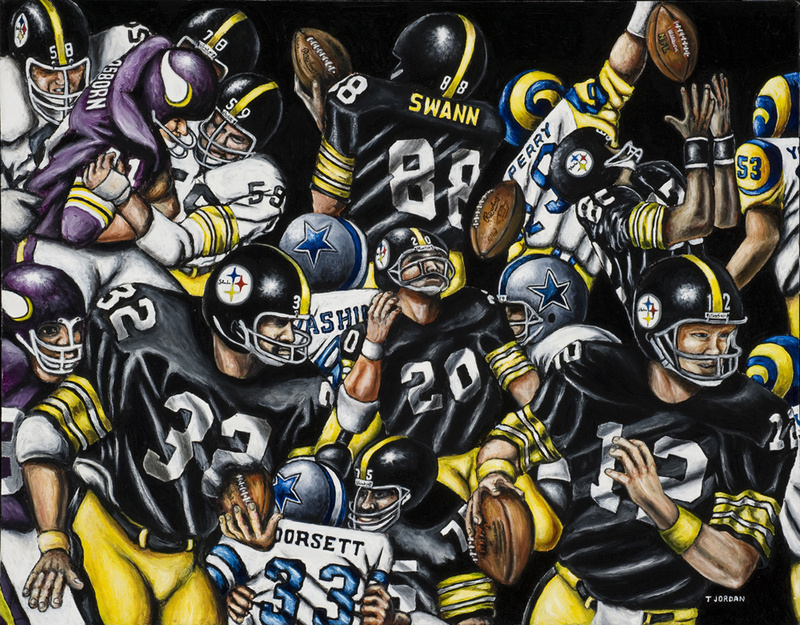 Playoff game against the Seahawks. 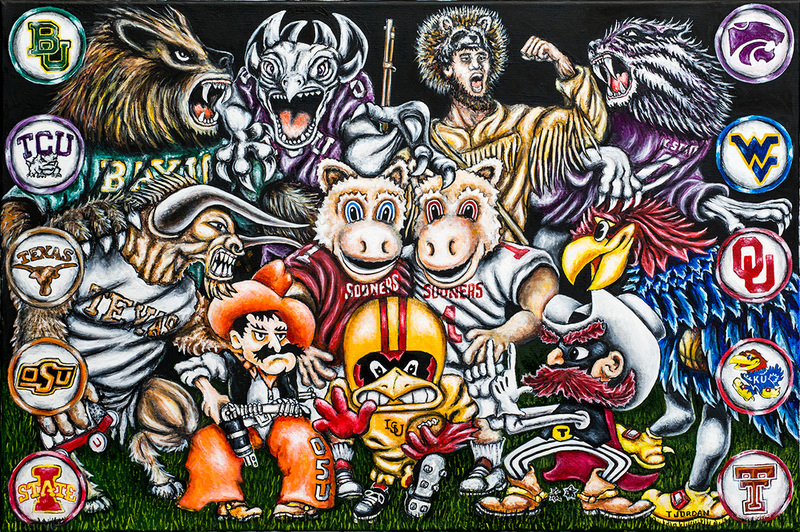 Oregon Ducks vs. Washington Huskies. 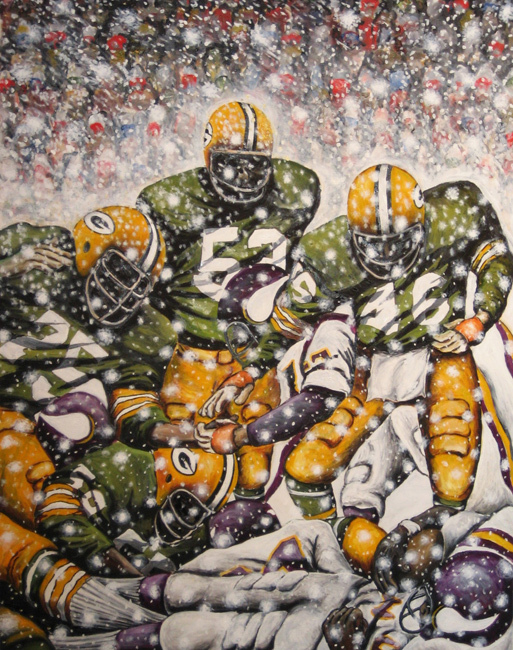 Green Bay Packers vs. Minnesota Vikings. 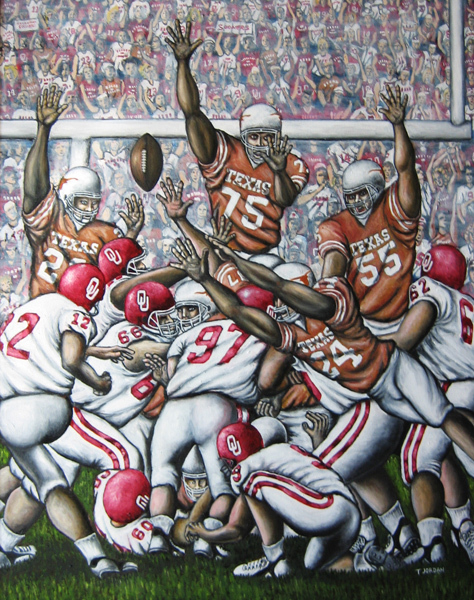 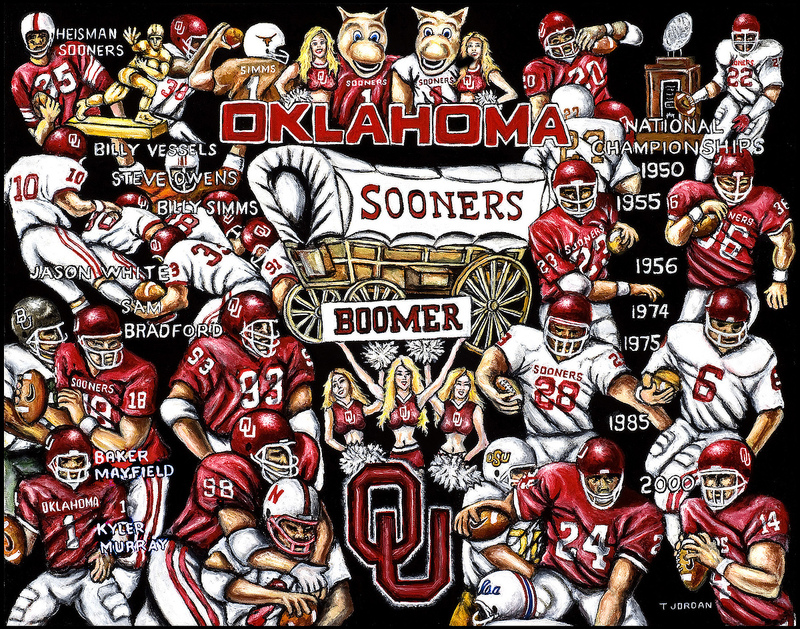 Oklahoma Sooners vs. Texas Longhorns. 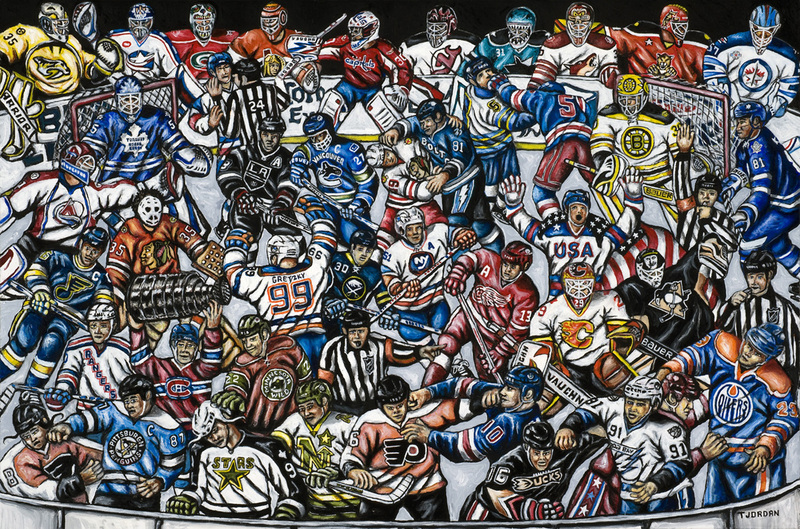 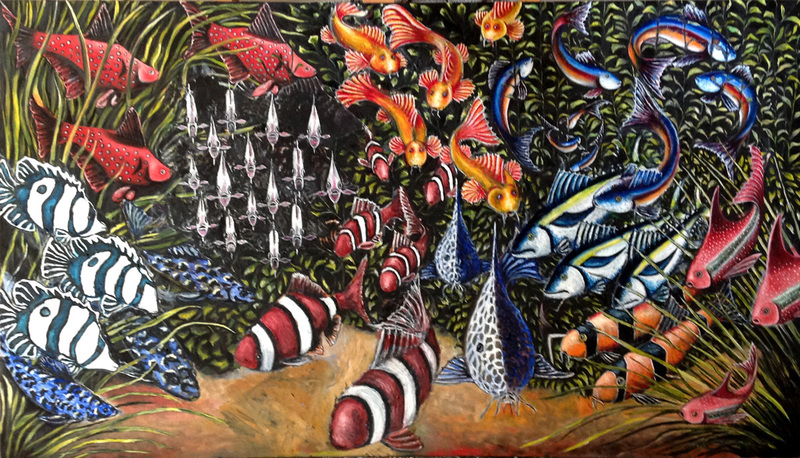 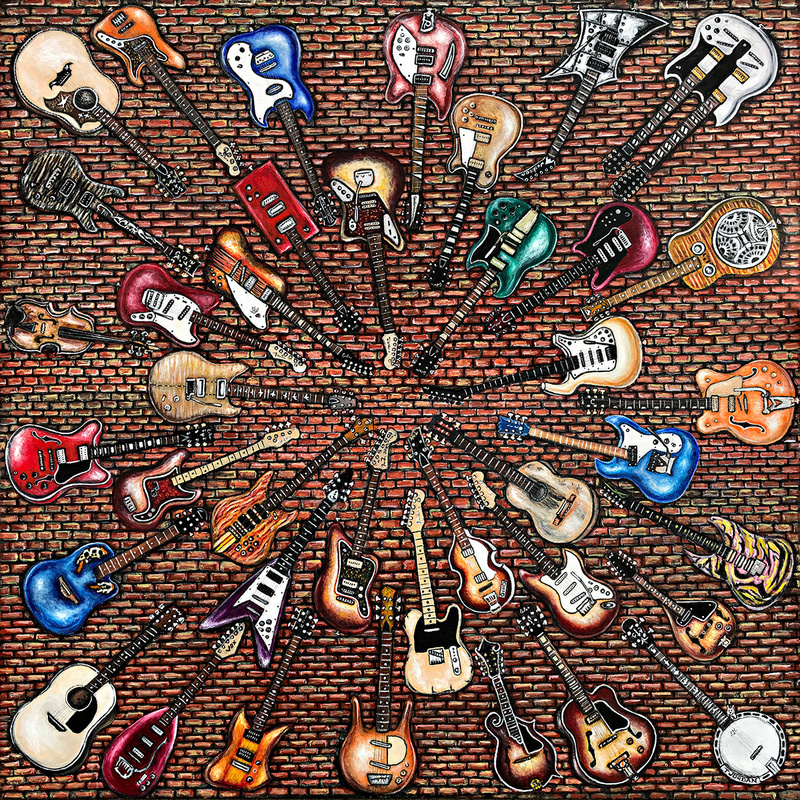 A bit removed from my sports themed paintings, I am enjoying a new venture into the entertainment venue and plan to complete several paintings in this area. 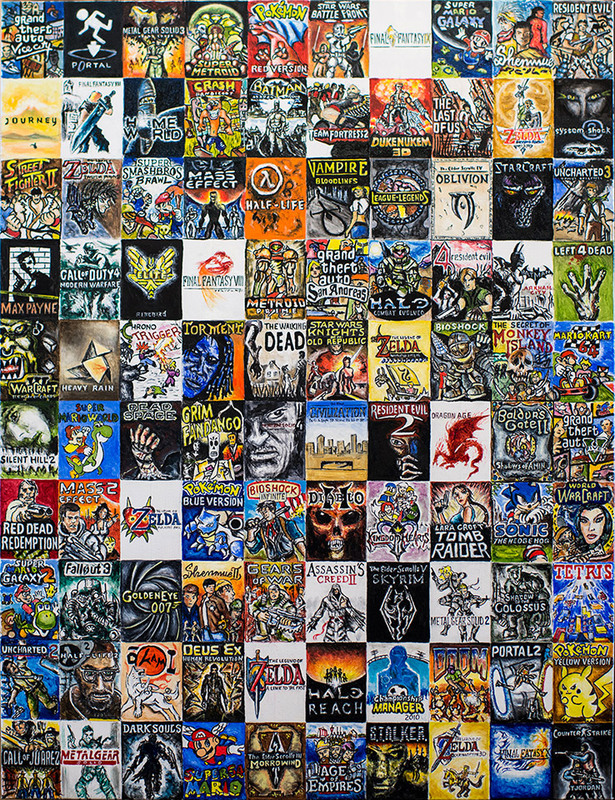 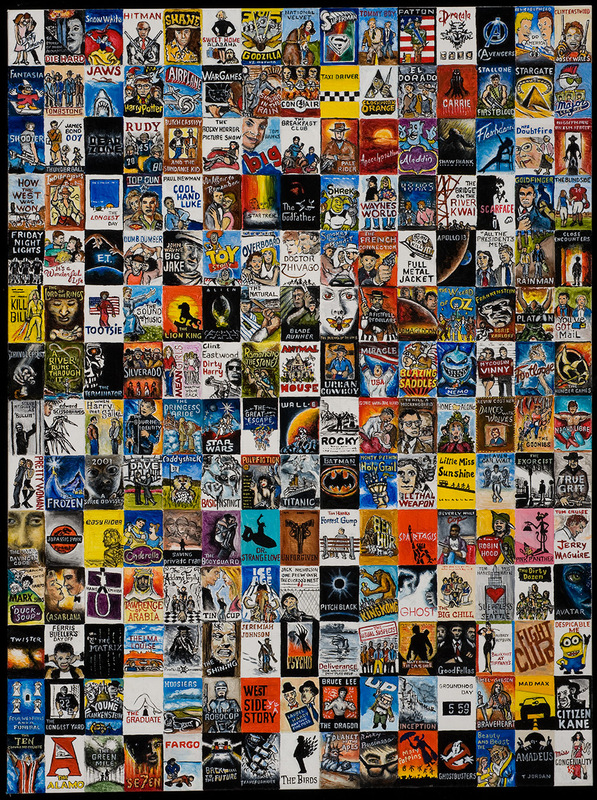 Select any image below to begin Classic Entertainment gallery view. 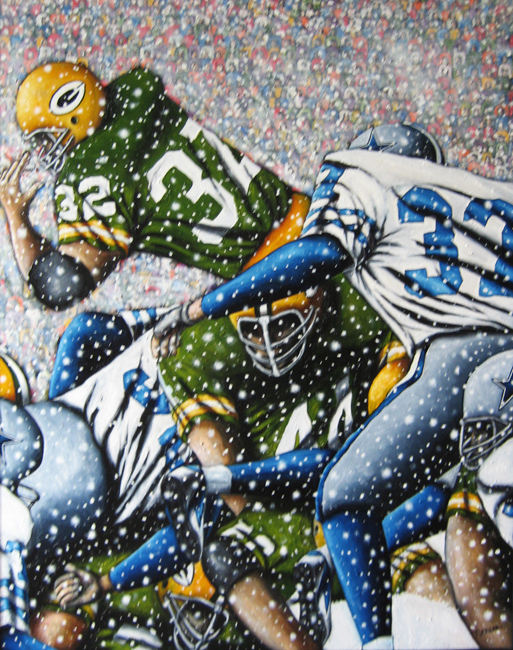 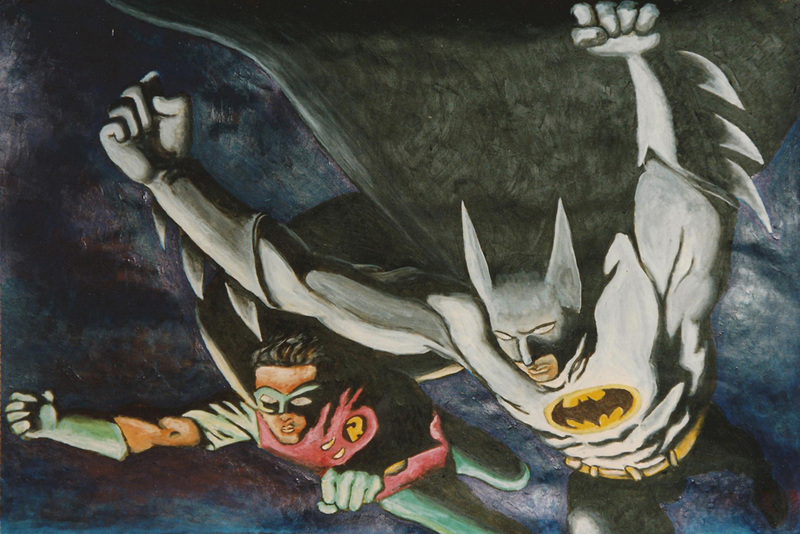 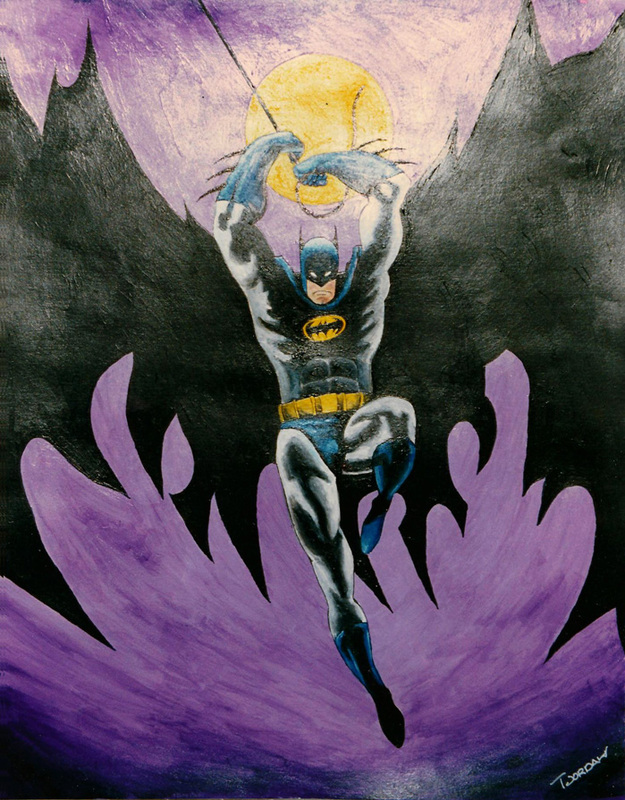 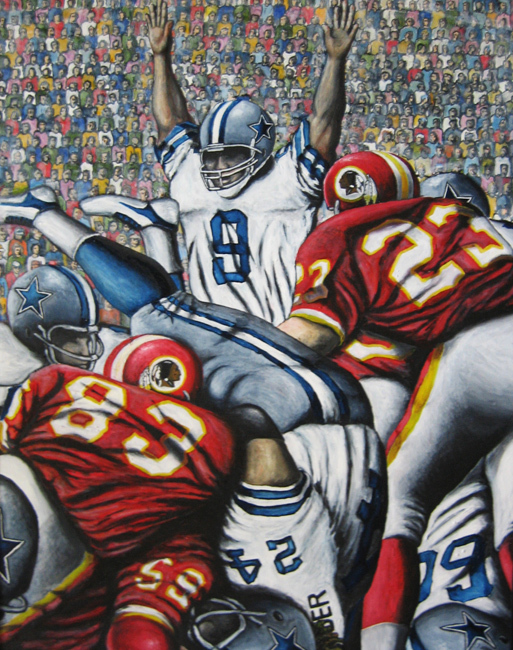 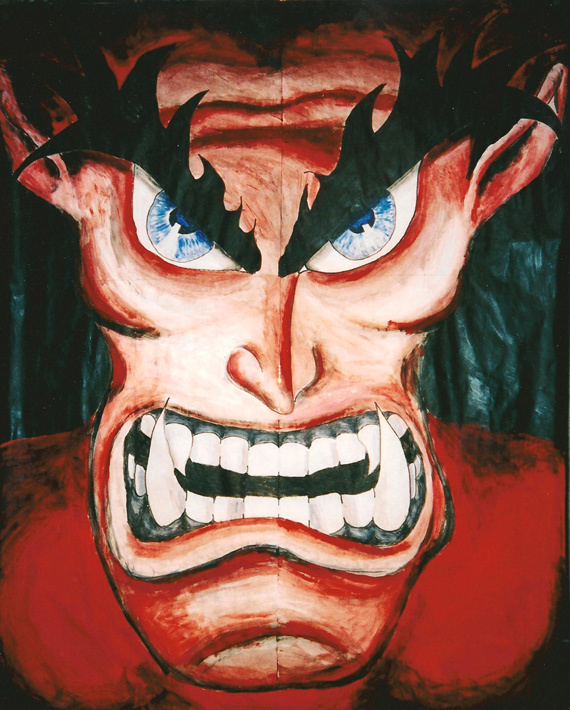 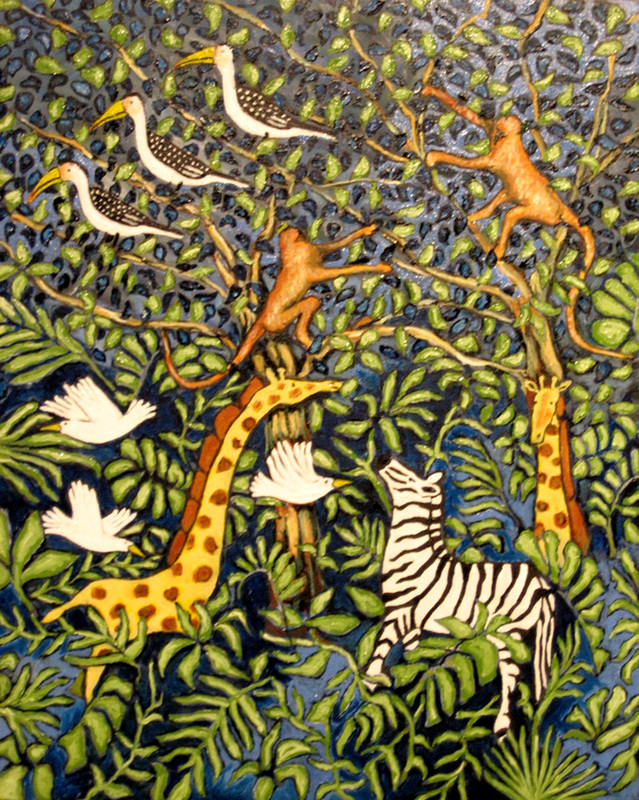 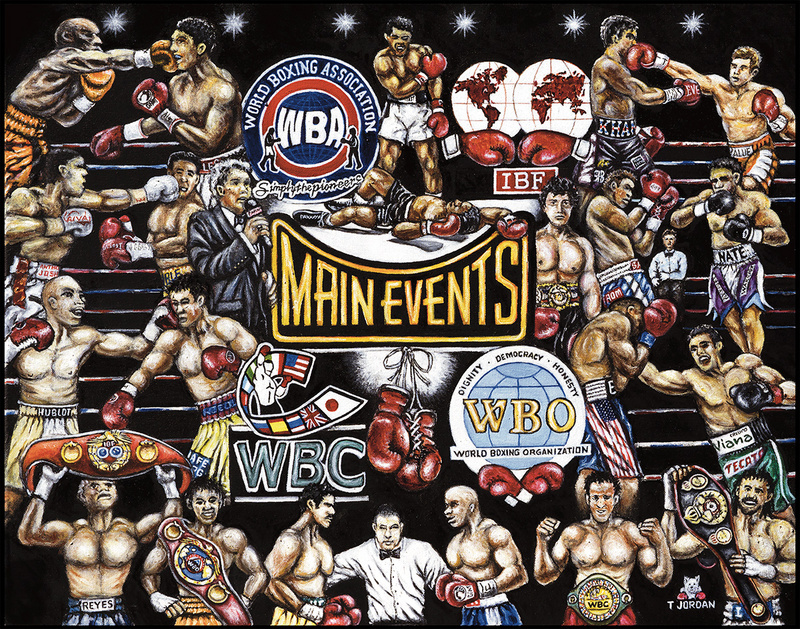 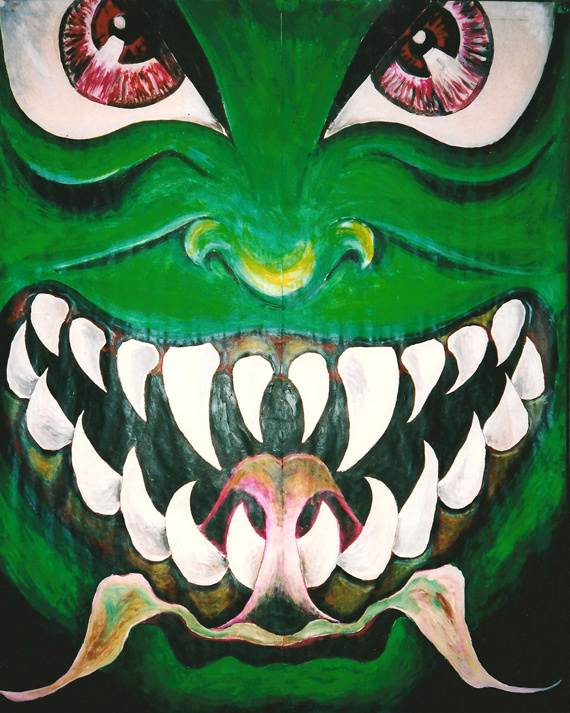 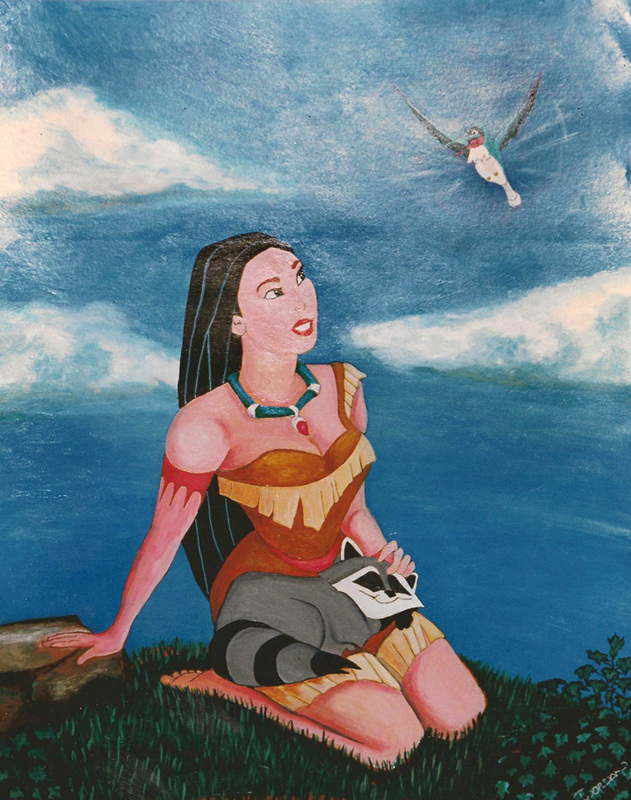 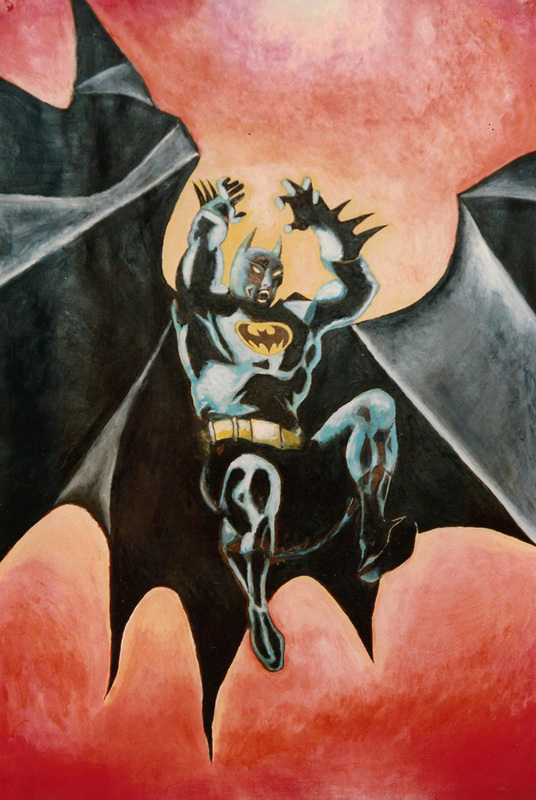 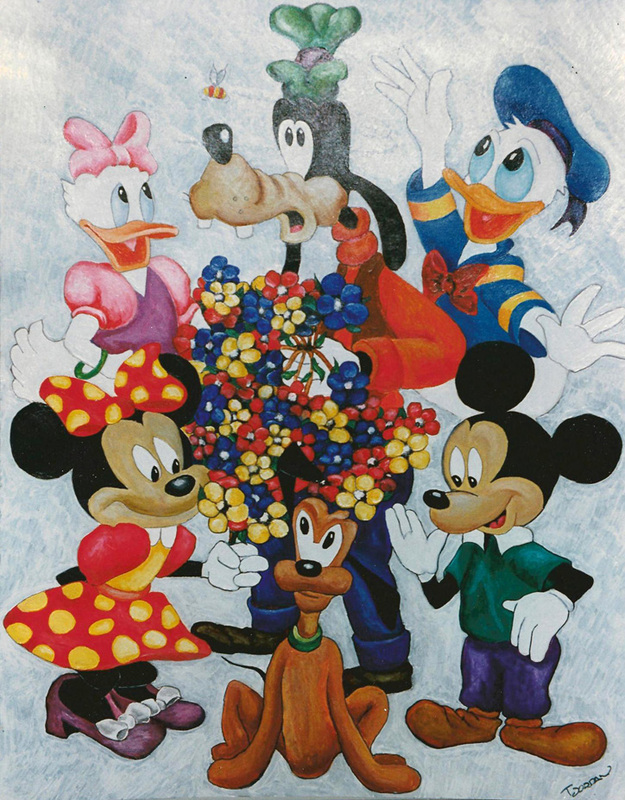 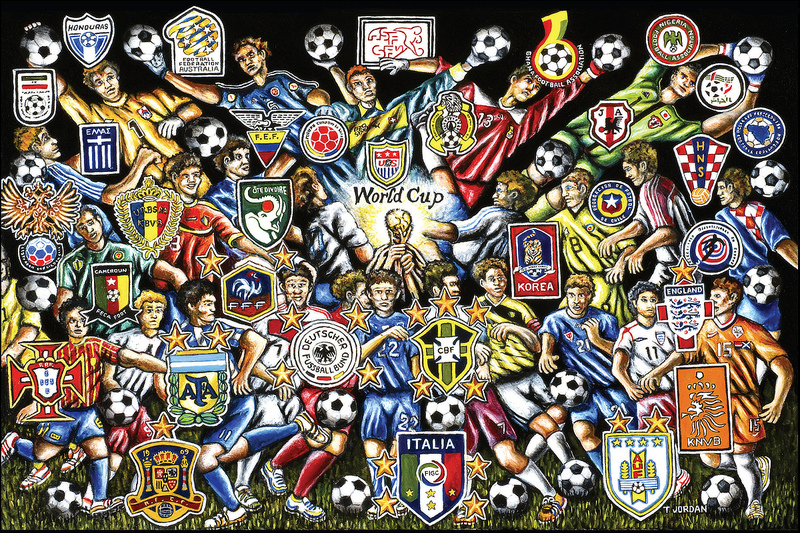 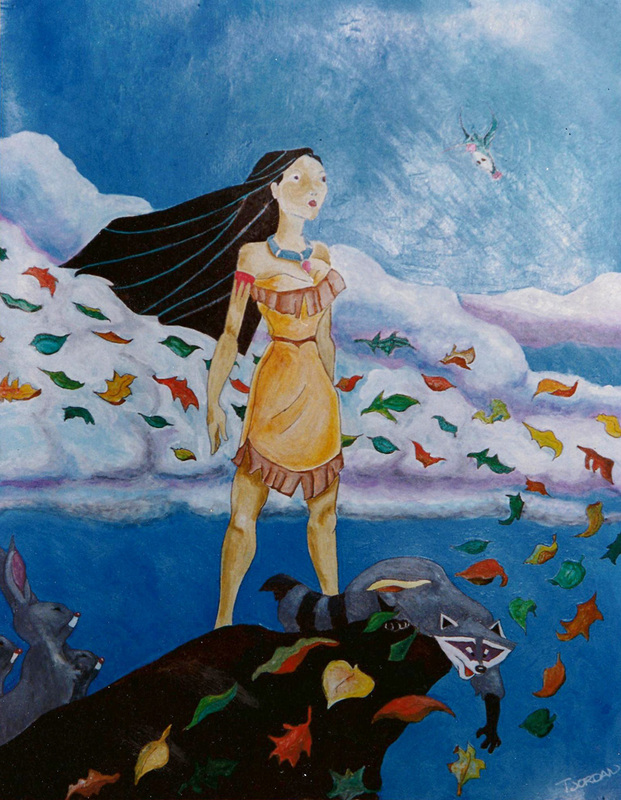 Although focusing mainly on sports themed paintings now, I have enjoyed painting other subjects over the years as well. 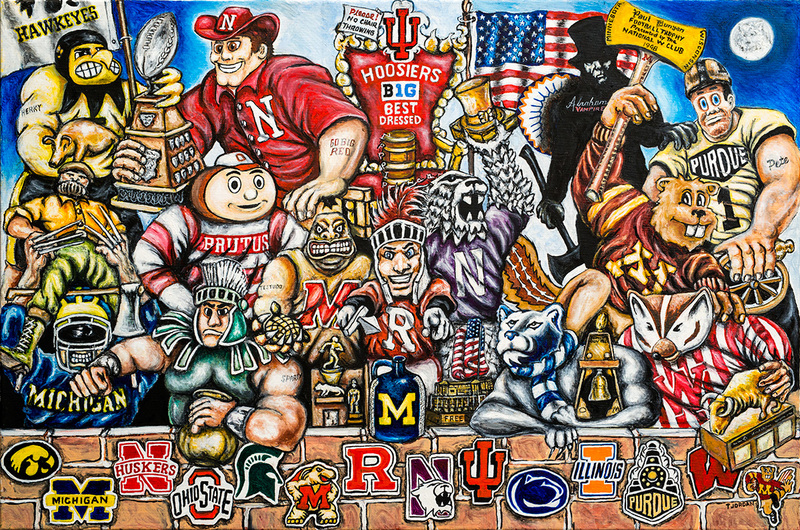 I am always happy to paint a commissioned work outside of the sports arena. 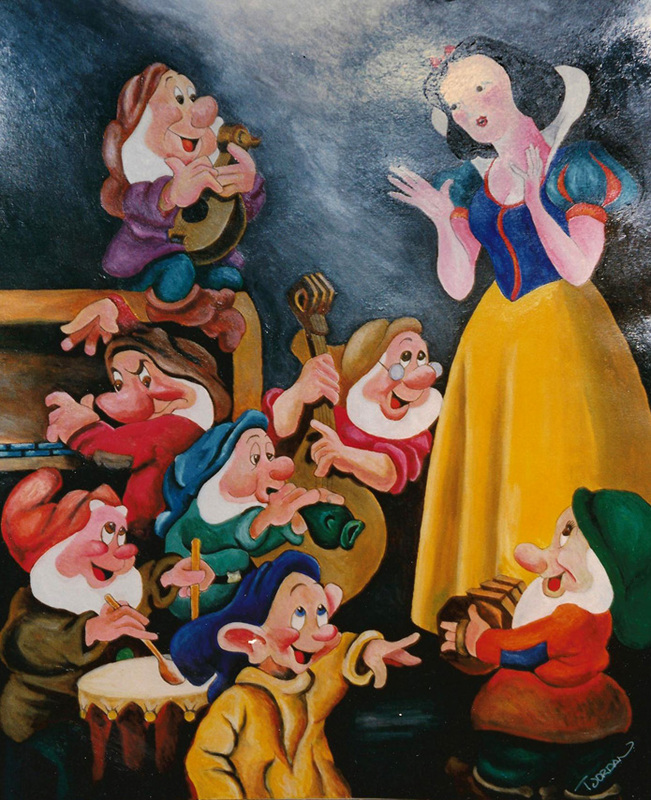 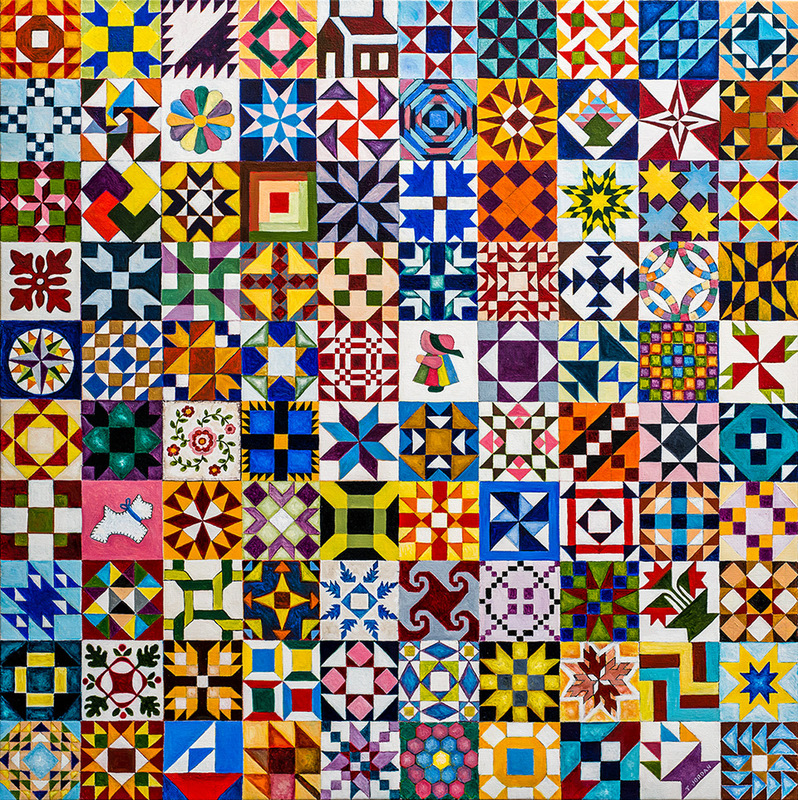 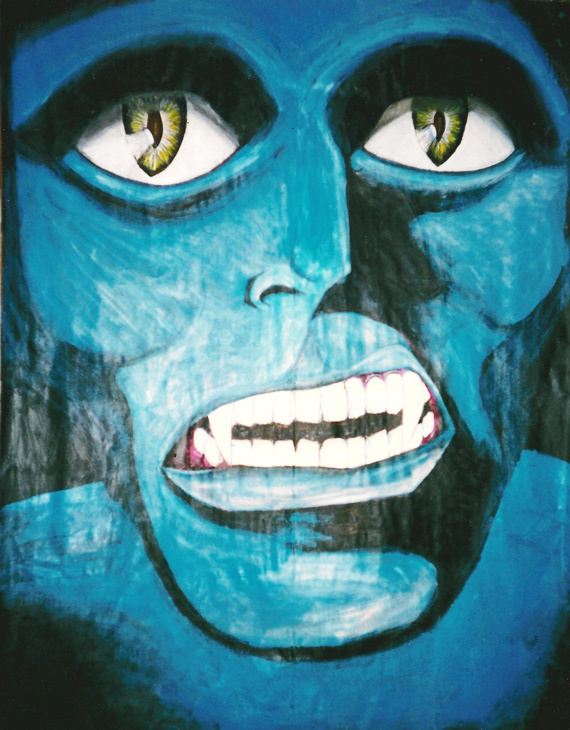 Select any image below to begin Animation -- Fantasy gallery view. 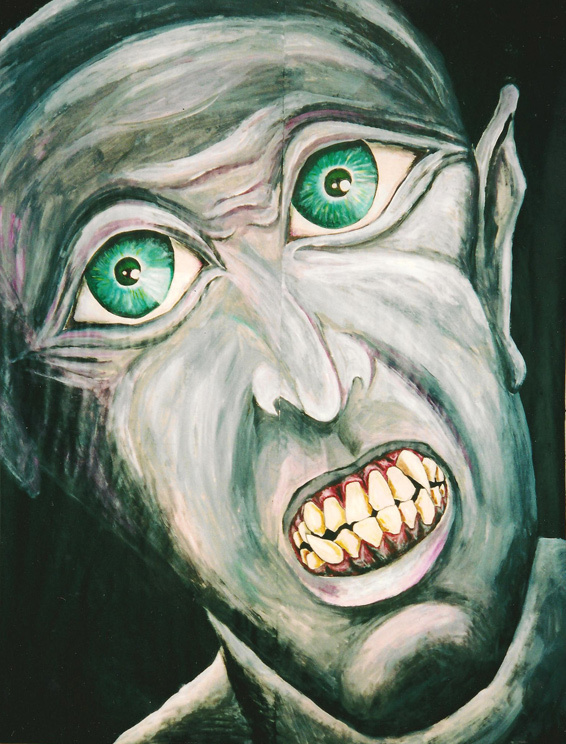 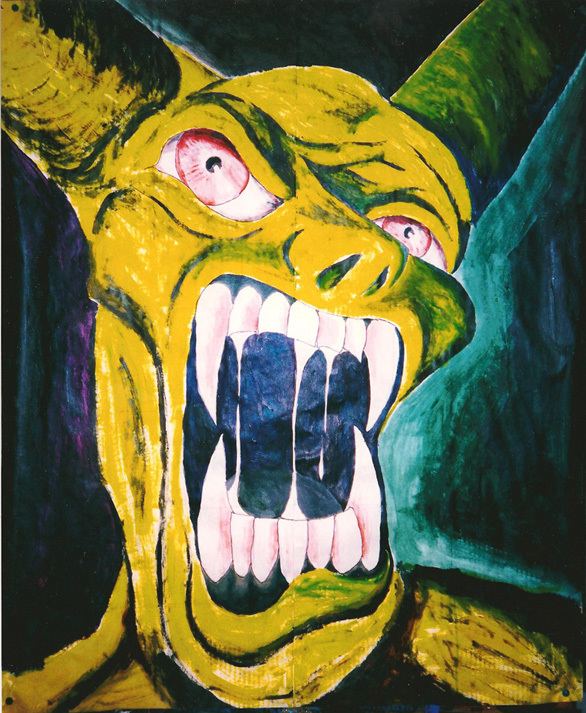 Never fully satisfied I continue to revisit this painting from time to time. 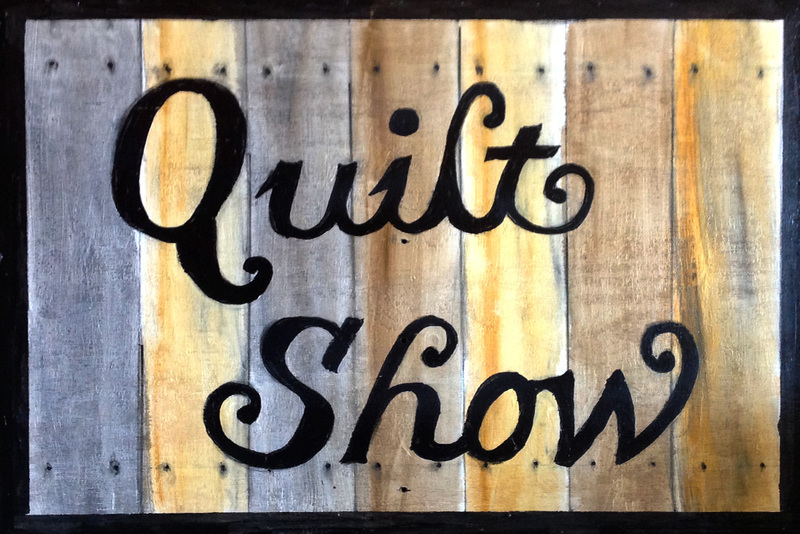 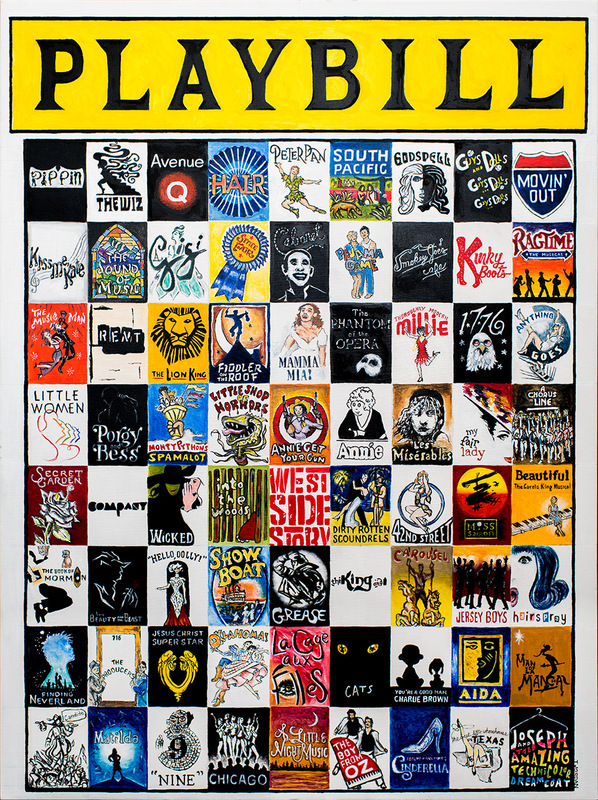 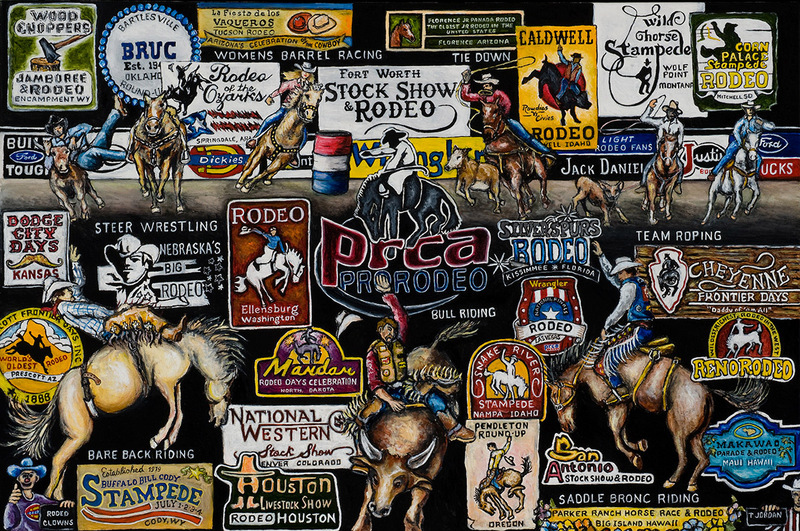 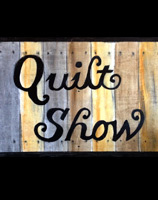 Two sided outdoor sign, commissioned for the Frisco Quilt Guild.